02/04/2019: Minor edits to section on manufacturing dates. 01/23/2016: Added Kraeuter 1923-8 Bent-Nose Combination Pliers. 01/19/2016: Added Kraeuter 1913-7 Bent Thin-Nose Combination Pliers. 01/16/2016: Added Kraeuter 1831-8 "Supreme" Lineman's Pliers. 01/12/2016: Added Kraeuter 430-3/8 Flat Chisel. 01/07/2016: Added Kraeuter 1973-5.5 "Supreme" Combination Pliers. 12/30/2015: Added Kraeuter 1691-6 Needlenose Pliers. 12/29/2015: Added Kraeuter 4 Inch Calipers. 12/27/2015: Added Kraeuter 1601-4 Flat-Nose Pliers. 12/26/2015: Added Kraeuter 1903-7 Thin-Nose Combination Pliers. 12/25/2015: Added Kraeuter 2611-6.5 Heavy-Duty Diagonal Cutters. 12/24/2015: Added Kraeuter 356-10 Combination Pliers, Kraeuter 360-6 Combination Pliers, and Kraeuter 4601-6 "Supreme" Diagonal Cutters. 12/23/2015: Added Kraeuter 1611-6 Round Nose Pliers. 12/21/2015: Added Kraeuter 1771-7 Extra Long Nose Pliers and Kraeuter 1850-7 "Supreme" Nippers. 12/20/2015: Added Kraeuter 1913-7 Bent Thin-Nose Combination Pliers and Kraeuter 951-7 "Supreme" Battery Pliers. 12/19/2015: Reorganized sections, added Kraeuter 2801-7 "Dreadnought" Lineman's Pliers. 12/10/2015: Added Kraeuter 1863-9 "Grip-All" Gas and Burner Pliers. 12/01/2015: Added Kraeuter 743-8 8 Inch Slip-Joint Angle-Nose Pliers. 11/15/2015: Added a 1904 notice for an adjustable alligator wrench. 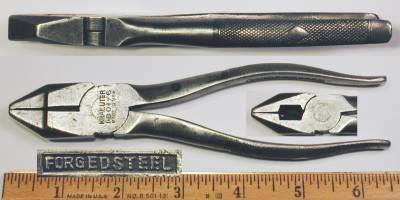 10/30/2015: Added a 1903 notice for Kraeuter universal pliers. 12/19/2011: Added Kraeuter 1933-5-1/2 Thin-Nose Combination Pliers. 12/12/2011: Added a Kraeuter A3134 Open-End Wrench. 12/02/2011: Added a Kraeuter A2528 Open-End Wrench. 12/01/2011: Added Kraeuter 1801-7 Lineman's Pliers. 10/27/2011: Added Kraeuter 1841-10 Button's Pattern Pliers. 06/19/2011: Split into two pages, added Kraeuter "Grip-All Jr" 1863-6-1/2 Gas and Burner Pliers. 06/16/2011: Added Kraeuter 743-7 Angle-Nose Pliers. 06/15/2011: Added Kraeuter 1973-7 Combination Pliers. 06/06/2011: Added Kraeuter 4801-8-1/2 "Supreme" Lineman's Pliers. 06/01/2011: Added Kraeuter 356-5-1/2 Combination Pliers. 05/07/2011: Added Kraeuter 1621-6 Needlenose Pliers. 04/28/2011: Added Kraeuter Later 1973-5-1/2 Combination Pliers. 04/24/2011: Added Kraeuter 356-10 Combination Pliers. 04/21/2011: Added Kraeuter 2801-8-1/2 "Dreadnought" Lineman's Pliers. 04/19/2011: Added Kraeuter 1943-10 Waterpump Pliers. 04/16/2011: Minor reorganization, added Kraeuter "Grip-All Jr" 1863-6-1/2 Gas and Burner Pliers. 04/15/2011: Added Kraeuter Later 1841-8 Button's Pattern Pliers. 04/14/2011: Added Kraeuter 1903-7 Thin Combination Pliers. 04/13/2011: Added Kraeuter 1821-8 Lineman's Universal Pliers. 04/10/2011: Added Kraeuter 1771-7 Extra Long Nose Pliers. 04/02/2011: Added a Kraeuter C-1214 Check-Nut Wrench. 03/28/2011: Added Kraeuter 92 Tappet Wrench. 03/11/2011: Added Kraeuter 356-8 Combination Pliers. 03/04/2011: Added Kraeuter 1923-8 Bent-Nose Combination Pliers. 02/26/2011: Adjusted production dates for pliers with variant "Don't Slip" pattern. 02/10/2011: Added Kraeuter Early [2801-6] "Dreadnought" Lineman's Pliers. 02/03/2011: Added Kraeuter 1711-5 Long-Nose Pliers. 01/31/2011: Added Kraeuter 1850-7 "Giant Nipper" End Nippers. 01/29/2011: Added Kraeuter 2601-6 Diagonal Cutters. 01/01/2011: Added Kraeuter 1873-7 Combination Pliers with Side-Cutters. 12/12/2010: Added Kraeuter 1821-7-1/2 "Universal Combination" Pliers. 11/08/2010: Added Kraeuter Early 1923-10 Bent-Nose Combination Pliers. 08/24/2010: Added Kraeuter Early 1841-6-1/2 Button's Pliers. 08/05/2010: Added Kraeuter 356-5-1/2 Combination Pliers. 07/22/2010: Added Kraeuter 1850-7 "Giant" End Nippers. 07/04/2010: Added manufacturing date estimates based on "Newark" marking, added Kraeuter 1880-10 1/2 Staple-Pulling Plier. 06/22/2010: Added Kraeuter 1631-5 1/2 Bent Needlenose Pliers. 06/17/2010: Added Kraeuter 1841-10 Button's Pliers. 06/15/2010: Added Kraeuter 1851-7 "Giant" End Nippers. 06/12/2010: Added list for estimating manufacturing dates, added Kraeuter 356-8 Combination Pliers and Kraeuter 1821 "Universal Combination" Pliers. 06/11/2010: Reorganized pliers section, added Kraeuter Early 1821 "Universal Combination" Pliers. 04/23/2010: Added Kraeuter "The Victor" Adjustable Alligator Wrench. 11/01/2009: Added Kraeuter 743-8 Angle-Head Pliers. 10/13/2009: Added Kraeuter 1821 7 Inch Lineman's Universal Pliers. 10/07/2009: Added Kraeuter 1821-5-1/2 5.5 Inch Lineman's Universal Pliers. 10/06/2009: Added Kraeuter 1671 6 Inch Needlenose Pliers. 10/05/2009: Added Kraeuter 1850-6 Giant Nippers. 10/04/2009: Added Kraeuter 2801-7 "Dreadnought" Lineman's Pliers. 09/27/2009: Added Kraeuter 1356-6 Combination Pliers. 09/06/2009: Added Kraeuter 451-8 Glass Pliers. 07/26/2009: Added Kraeuter 1801-6 Lineman's Pliers. 04/30/2009: Added Kraeuter 1841-8 "Button's Pattern" Pliers. 04/06/2009: Added Kraeuter "US" 8 Inch Wire Cutting Pliers. 08/04/2008: Added Kraeuter 1771-7 Extra Long Nose Pliers. 06/23/2008: Added a Kraeuter A1619 Open-End Wrench. 02/14/2008: Added Kraeuter 1834-6 1/2 Lineman's Pliers. 01/24/2008: Added a Kraeuter 1202-13 Bearing Scraper. 12/11/2007: Added Kraeuter "US 1918" Wire Cutting Pliers. 12/02/2007: Added Kraeuter 1721-6 Long Nose Side-Cutting Pliers. 11/04/2007: Added Kraeuter K-Diamond 1380-7 Lineman's Pliers. 10/15/2007: Added Kraeuter 1851-5 Giant Nippers. 10/11/2007: Added Kraeuter Early 1801-8-1/2 Lineman's Pliers. 10/03/2007: Added Kraeuter 1850-5 Giant Nippers. 09/28/2007: Added Kraeuter 4501-4 1/2 Diagonal Cutters. 09/07/2007: Added Kraeuter 1601-4-1/2 Short Flat-Nose Pliers. 07/17/2007: Added Kraeuter Early 1841-8 "Button's Pattern" Pliers. 06/10/2007: Added a Kraeuter 403-5/8 Wood Chisel. 04/19/2007: Added a Kraeuter 430-1 Flat Chisel. 04/06/2007: Added a Kraeuter 430-3/4 Flat Chisel. 04/04/2007: Added a Kraeuter 635-1/2 Cape Chisel. 03/29/2007: Added Kraeuter 351-7 Brake Spring Pliers and a Kraeuter 342-1/2 Star Drill. 03/27/2007: Added Kraeuter 4700-7 Diagonal Cutters. 02/23/2007: Added Kraeuter 40-6 Thin-Nose Pliers. 02/20/2007: Added Kraeuter 1831-6-1/2 Electrician's Pliers, Kraeuter 1661-6 Needlenose Pliers, and a Kraeuter 330 1/2 Inch Chisel. 02/16/2007: Added Kraeuter 1801-8-1/2 Lineman's Pliers. 01/27/2007: Added Kraeuter 948 Battery Pliers. 01/02/2007: Added Kraeuter 1591-4-1/2 Milliner's Flat-Nose Pliers. 12/16/2006: Added Kraeuter 1751-6 Flat-Nose Pliers. 12/14/2006: Added Kraeuter 4501-6 Diagonal Cutters. 12/10/2006: Added Kraeuter 1741-6 Flat-Nose Pliers and Kraeuter 356-8 Slip-Joint Pliers. 12/09/2006: Added Kraeuter 1831-7 Lineman's Pliers and Kraeuter 2601-5 Diagonal Cutters. 12/06/2006: Added Kraeuter 1973-7 Slip-Joint Pliers. 12/04/2006: Added Kraeuter 1671-6 Needlenose Pliers. 12/03/2006: Added Kraeuter 356-6 Pliers. 12/01/2006: Moved to separate page. 11/29/2006: Added Kraeuter 1641-5 Short Needlenose Pliers. 11/27/2006: Added Kraeuter 1850-7 End Nippers. 11/19/2006: Added Kraeuter 1863-9 Pliers. 11/14/2006: Added Kraeuter K-Diamond 1380-6 Lineman's Pliers. 09/12/2006: Added a Kraeuter A2428 Open-End Wrench. 08/21/2006: Added a Kraeuter K9/16 Single-Offset Wrench. 08/15/2006: Added a Kraeuter A2225 Open-End Wrench. 08/14/2006: Added Kraeuter 1973-5-1/2 Slip-Joint Combination Pliers. 08/10/2006: Added Kraeuter "Victor" 305-7 Slip-Joint Pliers. 08/09/2006: Added several Kraeuter tools, Kraeuter 356-6 Slip-Joint Pliers, Kraeuter A1416 Open-End Wrench, Kraeuter A1820 Open-End Wrench, and a Kraeuter B2426 S-Shaped Open-End Wrench. Kraeuter & Company was an early tool maker, established in the mid nineteenth century and best known for their high quality pliers. Kraeuter & Company was founded by August Kraeuter, a German immigrant who came to America in 1859 at 22 years of age. Although the company's later catalogs and advertisements state that the company was established in 1860, the historical record doesn't seem to support such an early founding date. An early biography of August Kraeuter on page 247 of Biographical and Genealogical History of the City of Newark, published in 1898, notes that Kraeuter began employment in Newark, New Jersey working for a pistol maker, and then worked with Henry Sauerbier in the manufacture of arms for the government. By 1864 August Kraeuter was in the partnership of Heuschkel, Kraeuter & Company, and by 1869 with Foerster & Kraeuter. Finally, in 1878 Kraeuter began his own business manufacturing tools. The company's earliest products were primarily machinists tools such as calipers. In 1902 August Kraeuter sold the business to Arthur A. Kraeuter, his eldest son by his second marriage. Arthur A. Kraeuter had worked with his father and knew the business well, and proved to be an adept manager. Kraeuter & Company's products around this time included ticket punches, calipers, and specialty tools, but the company soon became a major manufacturer of pliers. The notice at the left was published on page 77 of the November 26, 1903 issue of The Iron Age. It shows the Kraeuter No. 305 universal pliers and explains how they work with objects of different shapes. By 1904 Kraeuter was producing a range of tools and hardware items, including ticket punches, calipers, chisels, punches, pliers, and wrenches. The notice at the left, published on page 50 of the February 13, 1904 issue of The Metal Worker, Plumber and Steam Fitter, illustrates a "Bonney Adjustable Alligator Wrench" made by Kraeuter. The "Bonney" in the notice refers to Charles S. Bonney, who received a patent for the tool. An example of this tool can be seen as the Kraeuter Adjustable Alligator Wrench in a later figure. The small advertisement at the near left, published in the July 1904 issue of the Hardware Dealers' Magazine, shows the company's popular "The Victor" universal slip-joint pliers, a model that remained in production for many years. The full-page ad at the left, published on page 147 of the March, 1922 edition of Hardware Retailer, provides a snapshot of the Kraeuter line of that time. The illustration at the upper left appears to show a point-of-sale display board with many models of pliers. In the mid 1920s Kraeuter placed advertisements in some of the popular magazines of the day. A full-page ad in the May 1924 issue of Popular Science on page 93 provides a snapshot of the company's products at the time. Included in the illustration are the No. 1661 Needle Nose Pliers, No. 356 Slip-Joint Pliers, No. 1973 Slip-Joint Pliers, No. 1831 Electrician's Side-Cutting Pliers, and No. A1618 Open-End Wrench. Currently we don't have much information on Kraeuter's operations during the 1930s to 1950s, but hope to fill in more later. By the early 1960s Kraeuter had been acquired by Dresser Industries, a conglomerate making tools and machinery. Dresser later acquired Sherman-Klove (S-K) and Lectrolite, and by 1965 the Kraeuter line had been expanded to include sockets and drive tools. Unlike most of its competitors, Kraeuter did not make use of trademarked brand names, preferring to use just the company name. Even the company name was not registered until the 1960s, when "Kraeuter & Company" was registered as #775,742 on August 25, 1964. The first use date given with this late registration was 1910, but we know from earlier advertisements that Kraeuter was using its name well before then. This shows the danger of relying on first-use dates provided at a much later time. Kraeuter tools were not marked with an explicit manufacturing date or code, so any estimate of the manufacturing date must be made based on construction, markings, or other factors. In order to assist with estimating manufacturing dates, we hope to develop some guidelines based on tool markings and other characteristics. For now, the following list of events and observations may be helpful in determining the manufacturing date for some tools. 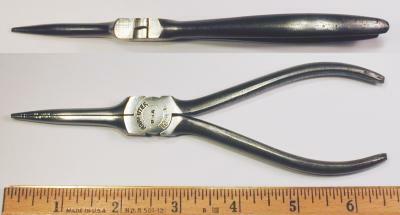 The 1904 Tower & Lyon catalog shows Kraeuter pliers with smoothly polished handles. This type of handle finish is believed to have been used until around 1910, when patterned handles were introduced. Some time around 1910 Kraeuter began offering patterned handles on its pliers, initially using a dimpled field with a raised diamond in the center. The pattern was actually forged into the handles, initially with a "Forged Steel" marking appearing on the underside. We'll refer to this as the "Dimple-Diamond" pattern in the text. The exact date of the introduction of patterned handles is not yet known, but hopefully the estimate can be refined by advertisements or catalogs. When Kraeuter introduced its patterned handles, it also added a "Forged Steel" marking forged into the underside of the handles. The "Forged Steel" marking remained in use until about 1924, when it was replaced by the "Kraeuter, U.S.A." marking (see below). In 1914 A.A. Kraeuter received design patent D46,682 for a decorative pattern for plier handles. The Kraeuter catalogs referred to this as the "Don't Slip" pattern, making it clear that the pattern was intended to be functional as well as decorative. The "Don't Slip" pattern was initially used only for the 2801 "Dreadnought" lineman's pliers, but gradually replaced the older Dimple-Diamond pattern on most other models. 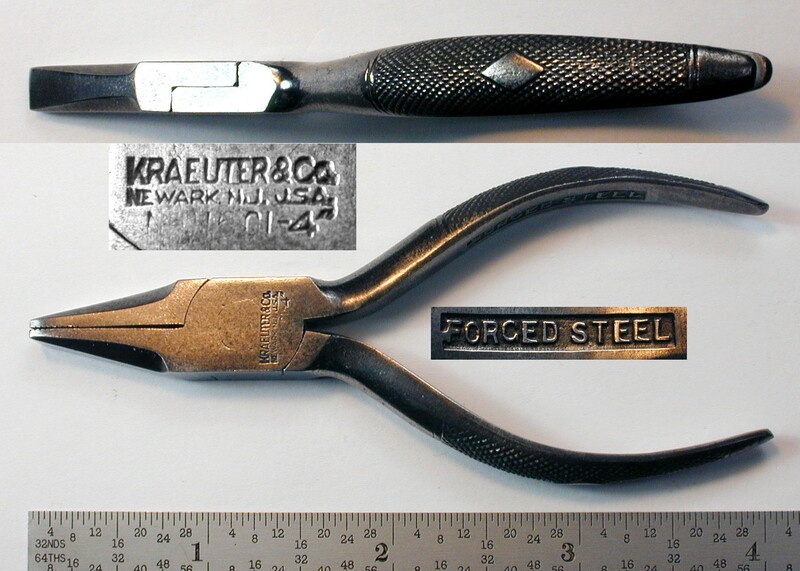 Older Kraeuter tools were generally marked with the Newark factory location. Although we're not sure exactly when the location marking was dropped, by observation most (but not all) tools with the "Forged Steel" marking are also marked for Newark. In addition, some pliers with a 1921 variant of the "Don't Slip" handle pattern also bear a Newark marking. These observations suggest that the Newark marking was in use up to around 1921. Note that the significance of the Newark marking does not apply to the later K-Diamond line of tools. Later Variation of "Don't Slip" Handle Pattern. In 1921 A.A. Kraeuter received design patent D59,602 for a decorative gripping pattern similar to the earlier "Don't Slip" pattern. This variant of the "Don't Slip" pattern was used on some pliers, although less frequently than the earlier pattern. The presence of the variant "Don't Slip" pattern should indicate production in 1920 or later. By 1924 Kraeuter was using a "Kraeuter U.S.A." marking forged into the underside of patterned handles, replacing the earlier "Forged Steel" marking. The 1924 date is based on advertisements published in Popular Science, which clearly show the use of this marking. 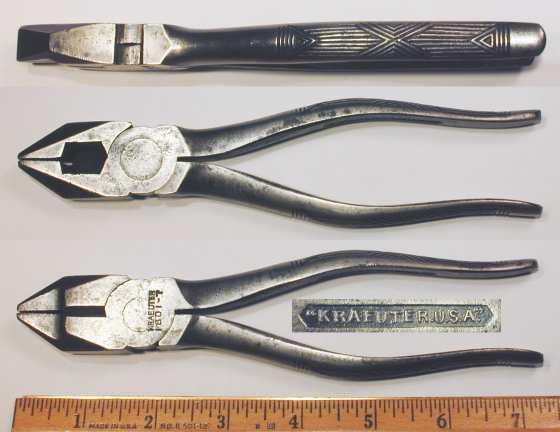 We have some evidence that the "Kraeuter U.S.A." marking was phased in gradually, likely beginning around 1920 or 1921, as one example of Kraeuter 305-7 Pliers is known with a mix of older and newer markings. 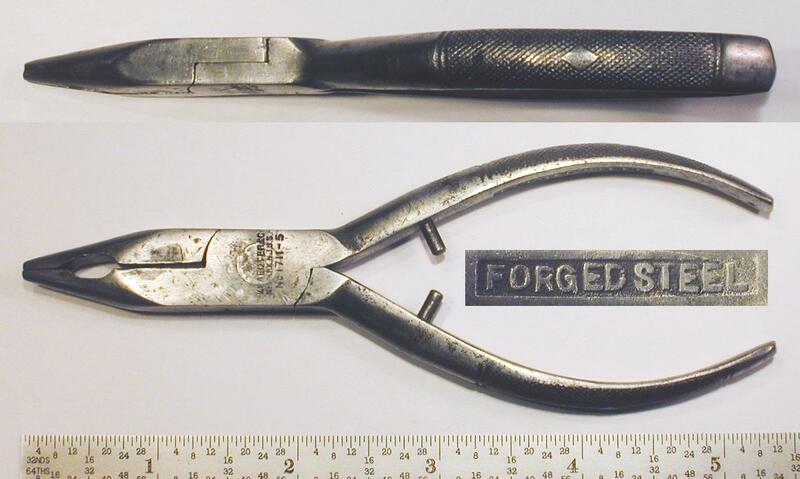 This marking was used into the 1930s, but by 1939 some pliers were being illustrated with smooth undersides. The 1929 catalog showed most models of combination pliers with screwdriver tips for the models of size 6 inches and over. By 1934 the models 356 and 1923 pliers no longer had screwdriver tips, and by 1939 none of the models had screwdriver tips. In the late 1930s Kraeuter introduced the K-Diamond line of economy pliers. By the mid 1940s (or earlier) Kraeuter was using a simplified stamped handle pattern, instead of the forged "Don't Slip" pattern. This change was likely introduced to reduce production costs. 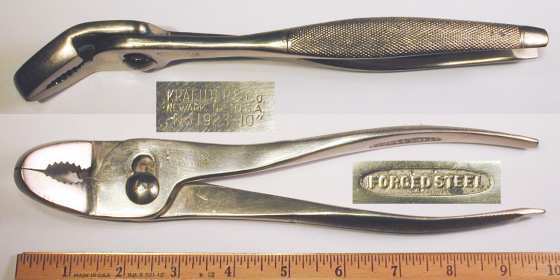 By 1946 Kraeuter had adopted a marking style with "Kraeuter" and the model number in a circle, with "USA" across the center, for most fixed-pivot pliers models. (Some models had "Kraeuter" and "USA" around the circle, with the model number across the center.) Although the 1946 catalog also illustrates many slip-joint pliers with the circular markings as well, in practice the slip-joint pliers appear to have kept the older linear markings, and the later 1959 catalog shows most slip-joint pliers with linear markings. Thus the presence of the circular marking style likely indicates production in 1946 or later. Product information was obtained from several Kraeuter catalogs, as summarized in the table below. The catalogs note that the company was established in 1860 and incorporated in 1907, and list their address as 569 Eighteenth Avenue, Newark, New Jersey. No. 14 Kraeuter Automobile & Mechanic's Tools 1929 High quality catalog in 9x6 inch size with 72 pages. Includes bound-in price sheet from May, 1930. No. 15 Kraeuter Automobile & Mechanic's Tools 1934 Model 743 "Sure-Grip" angle-nose pliers listed in three sizes. Model 4801 "Supreme" lineman's pliers offered. No. 18 Kraeuter High Grade Tools 1939 K-Diamond line of economy pliers offered. Some pliers illustrated without "Kraeuter U.S.A." handle marking. No. 20 Kraeuter Fine Tools 1946 All pliers regrouped into six product lines. Circular marking style illustrated on most pliers. Most pliers with plain or simplified "knurled" handles. No. 26A Kraeuter Fine Tools 1959 "Supreme" line no longer listed. Most models available with "Cushion Grip" handle covers. Kraeuter tools were sold through industrial and automotive distributors, and the catalogs of these companies provide descriptions and illustrations of the tools available at that time. The list below shows a sampling of these distributor catalogs. Tower & Lyon 1904. The 1904 catalog No. 12 of the Tower & Lyon Company has an extensive listing (26 pages) of Kraeuter tools. The listings include ticket punches, machinists calipers, gas pliers, the Victor universal pliers, chisels, and even carpet stretchers! This catalog is available as a reprint and is probably the best early catalog resource for Kraeuter tools. Central Automobile Supply 1916. A 1916 catalog from Central Automobile Supply (Des Moines, Iowa) lists several pages of Kraeuter tools. Two pages of pliers include model numbers 305, 356, 1621, 1631, 1721, 1781, 1801, 1850, 1863, 1873, 1903, 1923, 2601, and 2801. Model 356 pliers are listed in sizes 5.5, 6, 8, and 10 inches, all with a nickel finish. The handle patterns in the illustrations show most models with the Dimple-Diamond gripping pattern, but the No. 2801 "Dreadnought" pliers have the new (at that time) "Don't Slip" pattern. Other tools listed include bearing scrapers, chisels, punches, and the No. 365 "Victor" adjustable alligator wrench. Regarding the chisels, the catalog notes that they are forged of nickel steel, and states "... considered by experts the best chisel line ever made." J.M. Waterston 1916. The 1916 catalog No. 22 from J.M. Waterston, a tool distributor based in Detroit, lists several models of Kraeuter pliers on pages 192 to 196. The pliers include model numbers 356, 1801, 1834, 1850, 1873, 1903, 1923, and 2601. In the illustrations, all of the pliers have the dimpled field handle pattern with a central diamond, and the undersides of the handles have a "Forged Steel" marking. Harron, Rickard & McCone 1918. The 1918 catalog No. 2 from Harron, Rickard & McCone, an industrial distributor, lists five models of Kraeuter pliers on pages 140-141, with model numbers 305, 356, 1873, 1903, and 1923. The illustrations all show the "Dimpled Diamond" gripping pattern with "Forged Steel" on the underside. However, the descriptions of the Nos. 305, 1903, and 1923 models note the use of the "Don't Slip" handle pattern, suggesting that the handle patterns were being changed around this time. Chandler & Farquhar 1919. The 1919 catalog from the Chandler & Farquhar Company, an industrial distributor, lists three pages of Kraeuter pliers. Marwedel 1922. The 1922 catalog No. 11 from the C.W. Marwedel Company, an industrial supplier, lists one page of Kraeuter pliers. The models shown are No. 356 (four sizes), No. 1356 (two sizes), No. 1863-9, and No. 1873-7. The catalog also offers one model of bent nose slip joint pliers, but doesn't indicate the model number. Dunhan, Carrigan 1925. The 1925 catalog No. 73 from the Dunham, Carrigan & Hayden Company, a wholesale hardware supplier, lists Kraeuter pliers on pages 164-169 and Kraeuter wrenches on pages 226-227. This is one of the few catalog references for Kraeuter wrenches. Sligo Iron Store 1930. The 1930 catalog No. 70 from the Sligo Iron Store Company lists a number of models of Kraeuter pliers. The catalog listings include the No. 356 combination pliers, Nos. 1903 and 1933 thin-nose pliers, Nos. 1661, 1671, and 1771 needlenose pliers, No. 1801 Lineman's pliers, and No. 1851 giant end nippers. Ducommun "H" 1933. The 1933 catalog "H" from the Ducommun Corporation lists Kraeuter bearing scrapers on page 178, and offers a number of Kraeuter pliers on pages 182 to 186. A full-page ad in the May 1924 issue of Popular Science on page 93 shows some of the company's products at the time, including the No. 1661 Needle Nose Pliers, No. 356 Slip-Joint Pliers, No. 1973 Slip-Joint Pliers, No. 1831 Electrician's Side-Cutting Pliers, and No. A1618 Open-End Wrench. In the illustration, the No. 1973 pliers have the 1921 variant of the "Don't Slip" handle pattern, and two of the models have "Kraeuter U.S.A." forged into the underside of the handles. (The other plier handles were not visible in the illustration.) The illustration also includes a Kraeuter open-end wrench, currently the earliest known reference to Kraeuter wrenches. Fig. 1A. Kraeuter 4 Inch Calipers, with Inset for Marking Detail, ca. 1890s to 1900s. Fig. 1A shows a pair of Kraeuter 4 inch calipers, stamped "Kraeuter & Co." and "Newark, N.J." near the pivot. Fig. 1B. Kraeuter "The Victor" Adjustable Alligator Wrench, with Inset for Marking Detail, ca. 1904-1910. Fig. 1B shows a distinctive Kraeuter "The Victor" adjustable alligator wrench, stamped "The Victor" and "Pat. May 26, 03" on the head, with "Kraeuter & Co." and "Newark, N.J. U.S.A." on the movable jaw (see inset). The handle is marked with "Pat May 26 03" forged into a dimpled background, with "Forged High Carbon Steel" on the reverse (not shown). The overall length is 7.0 inches. Some traces of the original nickel plated finish can be seen on the jaws, but most has been lost due to extensive rust. The patent date refers to patent #728,842, filed in 1902 by Charles S. Bonney. Fig. 2. Kraeuter Early  8 Inch Lineman's "Universal Combination" Pliers, with Insets for Reverse and Side View, ca. 1908-1910. Fig. 2 shows an early pair of Kraeuter  8 inch "Universal Combination" pliers, combining flat and rounded gripping surfaces, lineman's side-cutters, Button's slot cutters, and awl plus screwdriver handle tips. 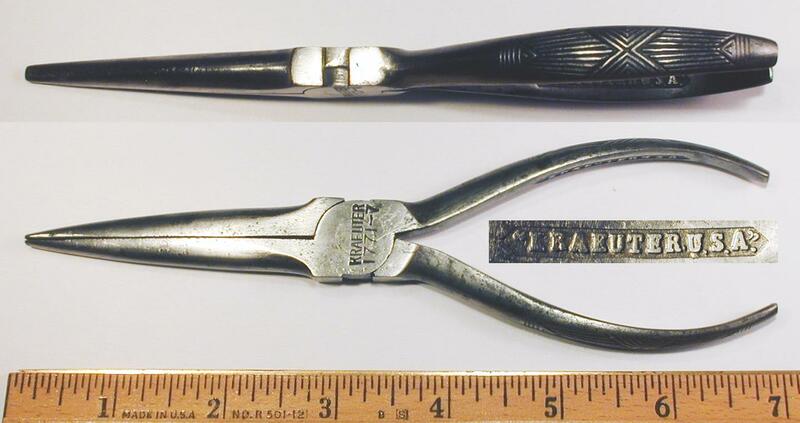 The pliers are stamped "Kraeuter & Co." and "Newark, N.J." on the reverse lower handle, with a faint (unreadable) marking "??SUR?? PAT?" on the upper handle. The overall length is 7.9 inches, and the finish is polished steel with a black oxide coating. One notable feature of these pliers is the addition of a pin to limit the opening such that the Button's style cutting slots come into alignment. (The surface of the pin can be seen below and to the right of the central pivot on the reverse side.) This feature was described by patent #953,170, filed by A.A. Kraeuter in 1908 and issued in 1910. This patent may be the subject of the unreadable marking on the reverse. The marking and construction features of this example indicate an early production date, probably before 1910. The highly polished but plain (not patterned) handles closely resemble the illustrations in the 1904 Tower & Lyon catalog, although this particular model is not shown. The plain marking style and inclusion of the Newark location is also characteristic of Kraeuter's early production. 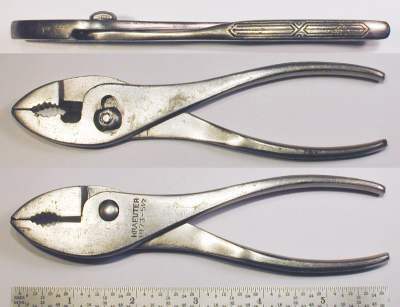 These pliers are significant as a good example of Kraeuter's production before the introduction of handle patterns, and in establishing the use of the limit pin feature in early Button's pliers. A later example of the 1821 pliers can be seen as the Kraeuter 1821 7 Inch Lineman's Pliers. Fig. 3. Kraeuter 1202-13 Bearing Scraper, with Insets for Reverse and Marking Detail, ca. 1910 to 1920s. Fig. 3 shows a Kraeuter 1202-13 bearing scraper with a wooden handle, stamped "Made in USA" and "Patd. 3-09-10" on the shank. The patent date refers to patent #953,171, filed in 1909 by A.A. Kraeuter and issued in 1910. Fig. 4. Kraeuter 305-7 "The Victor" 7 Inch Universal Pliers, with Insets for Handle Pattern and Detail, ca. 1920-1921. Fig. 4 shows a pair of Kraeuter 305-7 "The Victor" 7 inch slip-joint universal pliers, stamped "Kraeuter & Co." and "Newark, N.J. U.S.A." on the handle. 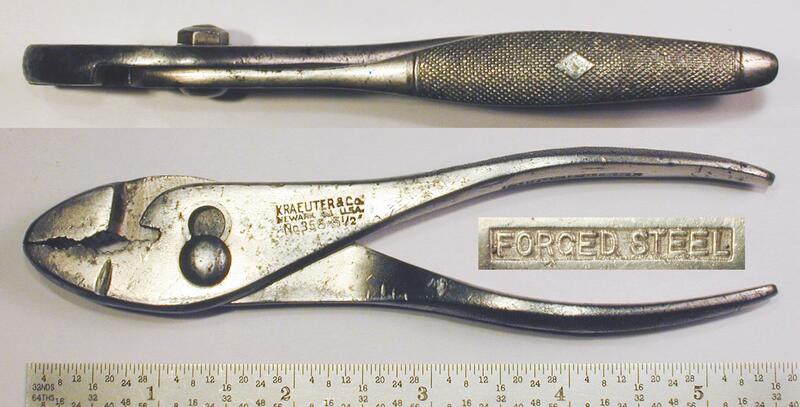 These pliers have an unusual mix of markings on the underside of the handles, with "Forged Steel" forged into the lower handle, but "Kraeuter U.S.A." forged into the upper handle and visible in the photograph. 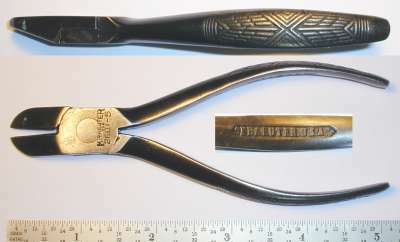 The middle inset shows the Dimple-Diamond gripping pattern on the handles, the earliest of the major handle patterns used by Kraeuter. 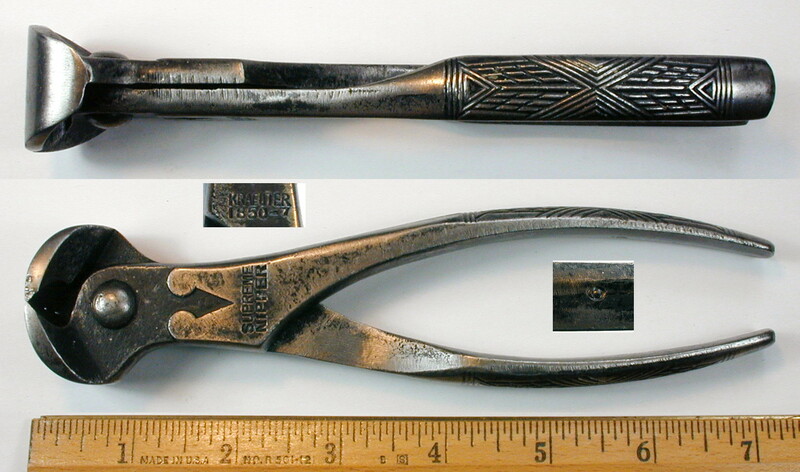 The mix of "Forged Steel" and "Kraeuter U.S.A." markings on these pliers suggests that the newer "Kraeuter U.S.A." marking was phased in over time, and probably began earlier than had been thought previously. 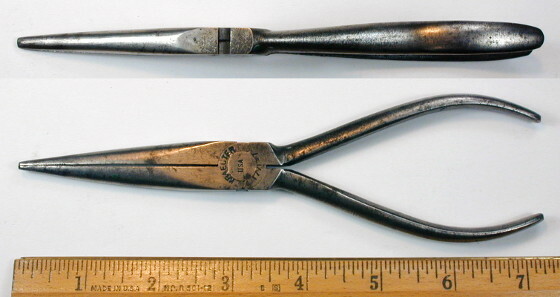 This pair of pliers is the only example known with mixed markings. The older and newer forged-in markings together with the stamped "Newark" marking suggest production around 1920-1921. The next figures show two generations of the Kraeuter 356 pliers in the 5.5 inch size. Fig. 5. Kraeuter 356-5-1/2 5.5 Inch Combination Pliers, with Insets for Side View and Marking Detail, ca. 1910-1920. Fig. 5 shows an early pair of Kraeuter No. 356-5-/12 5.5 inch slip-joint combination pliers, stamped with "Kraeuter & Co." and "Newark, N.J. U.S.A." on the handle, with "Forged Steel" forged into the underside of the handles. The overall length is 5.4 inches, and the finish is nickel plating, with minor losses due to wear. The top inset shows a side view of the pliers, illustrating the Dimple-Diamond gripping pattern on the handles. This is the earliest of the major handle patterns used by Kraeuter. Fig. 6. Kraeuter 356-5-1/2 5.5 Inch Combination Pliers, with Insets for Side View and Marking Detail, ca. 1924 to Late 1930s. Fig. 6 shows a later pair of Kraeuter No. 356-5-/12 5.5 inch slip-joint combination pliers, stamped with "Kraeuter" and the model number on the handle, with "Kraeuter U.S.A." forged into the underside of the handles. The overall length is 5.8 inches, and the finish is nickel plating, with losses due to rust. 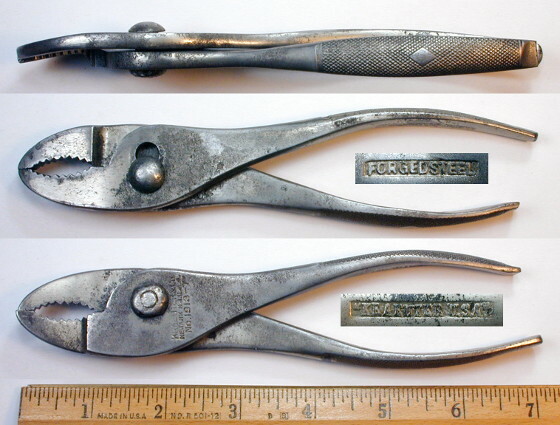 The top inset shows a side view of the pliers, illustrating the forged-in gripping pattern on the handles, referred to as "Don't Slip" in the 1939 catalog. This pattern was registered as design patent #D46,682, issued to A.A. Kraeuter in 1914. Fig. 7. Kraeuter 356-6 6 Inch Combination Pliers, with Insets for Handle Pattern and Detail, ca. 1910-1920. Fig. 7 shows an earlier pair of Kraeuter No. 356-6 6 inch slip-joint combination pliers, stamped "Kraeuter & Co." and "Newark, N.J. U.S.A." on the handle, with "Forged Steel" forged into the underside of the handles. The handle pattern for these pliers is a dimpled field with a central diamond. Fig. 8. Kraeuter 356-6 6 Inch Combination Pliers, with Insets for Side View and Marking Detail, ca. 1924-1933. Fig. 8 shows a later version of the Kraeuter 356-6 6 inch combination pliers, stamped with "Kraeuter" and the model number near the pivot, and with "Kraeuter U.S.A." forged into the underside of the handles. The handles are forged with a geometric pattern referred to as "Don't Slip" in the 1939 catalog. This pattern was registered as design patent #D46,682, issued to A.A. Kraeuter in 1914. The screwdriver tip indicates production before 1934. The next figures show several generations of the Kraeuter 356-8 pliers. By 1934 the model 356-8 pliers were being produced with three slip-joint positions. Fig. 9. Kraeuter 356-8 8 Inch Combination Pliers, with Insets for Side View and Marking Detail, ca. 1910-1920. Fig. 9 shows a earlier pair of Kraeuter No. 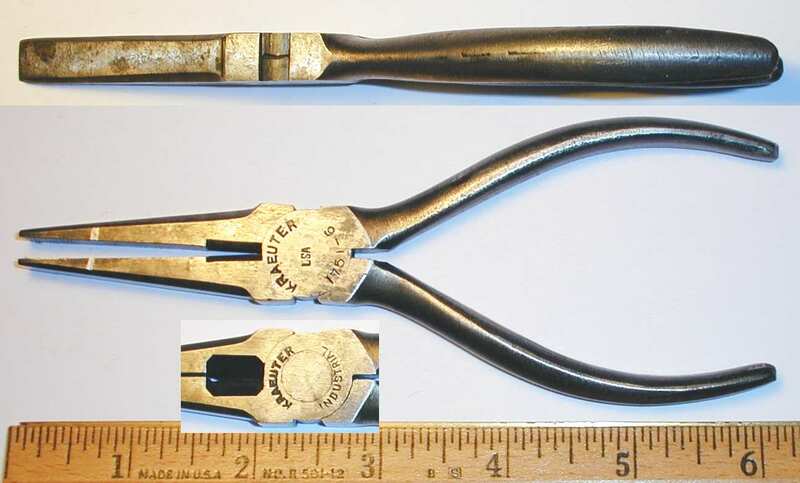 356-8 8 inch slip-joint combination pliers, stamped "Kraeuter & Co." and "Newark, N.J. U.S.A." on the handle, with "Forged Steel" forged into the underside of the handles. The overall length is 8.2 inches, and the finish is nickel plating. 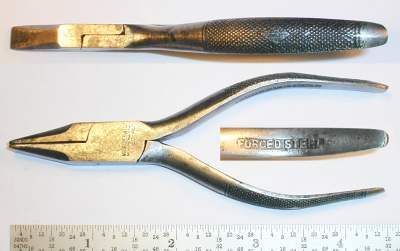 These pliers have the Dimple-Diamond gripping pattern on the handles, the earliest of the major handle patterns used by Kraeuter. Fig. 10. Kraeuter 356-8 8 Inch Combination Pliers, with Insets for Side View and Marking Detail, ca. 1924-1933. Fig. 10 shows a later pair of Kraeuter No. 356-8 8 inch slip-joint combination pliers, stamped with "Kraeuter" and the model number near the pivot, with "Kraeuter U.S.A." forged into the underside of the handles. The overall length is 8.2 inches, and the finish is nickel plating, with some losses due to rust. The top inset illustrates the "Don't Slip" gripping pattern on the handles. This pattern was registered as design patent #D46,682, issued to A.A. Kraeuter in 1914. The "Kraeuter U.S.A." marking suggests production in 1924 or later, and the two-position slip joint indicates production before 1934. Fig. 11. Kraeuter 356-8 8 Inch Combination Pliers, with Inset for Handle Pattern, ca. Mid 1940s to 1950s. Fig. 11 shows another later pair of Kraeuter 356-8 8 inch slip-joint combination pliers, stamped with the company name and "U.S.A." near the pivot. The overall length is 8.1 inches, and the finish is nickel plating. The inset shows the simplified gripping pattern for the knurled handles, suggesting production from the mid 1940s onward. 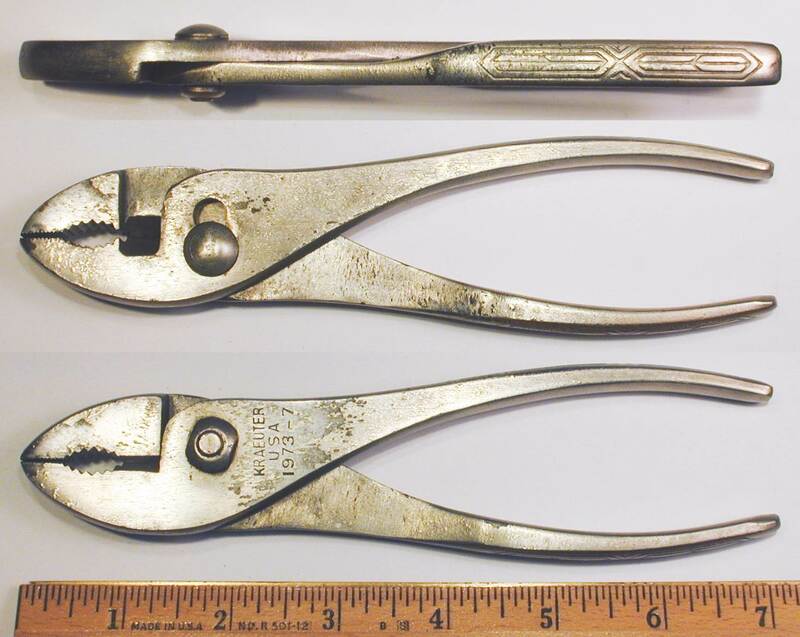 These larger pliers have three working positions for the slip-joint mechanism, a feature noted as early as the 1934 catalog. The next two figures show examples of the Kraeuter 356-10 pliers. By 1934 the 8 and 10 inch models were being produced with three slip-joint positions. Fig. 12A. Kraeuter 356-10 10 Inch Combination Pliers, with Insets for Side View and Marking Detail, ca. 1924-1933. Fig. 12A shows an earlier pair of Kraeuter 356-10 10 inch combination pliers, stamped with "Kraeuter" and the model number near the pivot, with "Kraeuter U.S.A." forged into the underside of the handles. The overall length is 9.8 inches, and the finish is nickel plating, with some losses due to wear. The top inset shows a side view of the pliers, illustrating the "Don't Slip" gripping pattern on the handles. The screwdriver tip and two-position slip-joint indicate production before 1934. Fig. 12B. Kraeuter 356-10 10 Inch Combination Pliers, with Inset for Side View, ca. Mid 1940s to 1950s. Fig. 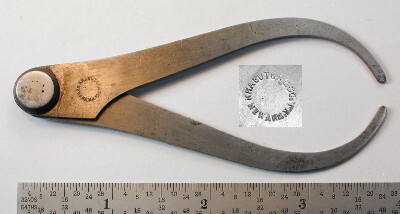 12B shows a later example of the Kraeuter 356-10 10 inch combination pliers, stamped with the company name and "U.S.A." near the pivot. The top inset shows a side view of the pliers, illustrating the simplified gripping pattern for the knurled handles. The simplified gripping pattern suggests production from the mid 1940s onward. Fig. 13A. Kraeuter 360-6 6 Inch Combination Pliers, with Insets for Side View and Marking Detail, ca. 1924 to Early 1930s. Fig. 13A shows a pair of Kraeuter No. 360-6 6 inch slip-joint combination pliers, stamped with "Kraeuter" and the model number near the pivot, and with "Kraeuter U.S.A." forged into the underside of the handles. 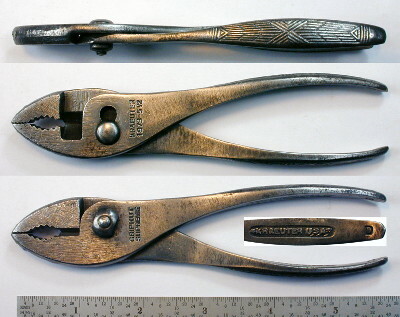 The top inset shows a side view of the pliers, illustrating the chevron-like geometric design similar to the Kraeuter "Don't Slip" pattern, but described by the later design patent #D59,602, filed by A.A. Kraeuter in 1920 and issued in 1921. The model 360 pliers were not listed in the 1934 catalog, suggesting that they had been discontinued by then. Fig. 13B. Kraeuter 1356-6 6 Inch Combination Pliers, with Insets for Side View and Marking Detail, ca. 1920-1921. Fig. 13B shows a pair of Kraeuter No. 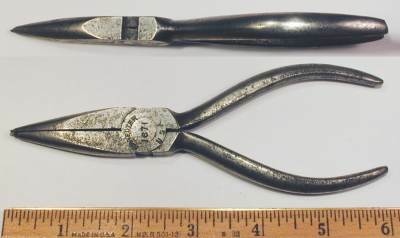 1356-6 6 inch slip-joint combination pliers, stamped "Kraeuter & Co." and "Newark, N.J. U.S.A." on the handle, with "Forged Steel" forged into the underside of the handles. The handle pattern on these pliers is a geometric design similar to the Kraeuter "Don't Slip" pattern, but described by the later design patent #D59,602, filed by A.A. Kraeuter in 1920 and issued in 1921. The use of the "Newark" marking with the later variant of the "Don't Slip" pattern suggests a manufacturing date around 1920-1921. The next figures show two generations of the Kraeuter model 1923-8 pliers. Fig. 14A. Kraeuter 1923-8 8 Inch Bent-Nose Combination Pliers, with Insets for Side View and Marking Detail, ca. Early 1920s. Fig. 14A shows an earlier pair of Kraeuter 1923-8 8 inch bent-nose combination pliers, stamped "Kraeuter & Co." and "Newark, N.J. U.S.A." with the model number near the pivot, with "Kraeuter U.S.A." forged into the underside of the handles. The overall length is 8.1 inches, and the finish is nickel plating, with extensive losses due to wear and rust. The top inset illustrates the bent-nose construction and the older dimpled gripping pattern on the handles, although without the central diamond panel. The "Kraeuter U.S.A." forged-in marking is somewhat unexpected on pliers with the older dimpled gripping pattern and "Newark" marking. This example may represent an early use of the handle marking. Fig. 14B. Kraeuter 1923-8 8 Inch Bent-Nose Combination Pliers, with Insets for Side View and Marking Detail, ca. 1930 to Late 1930s. Fig. 14B shows a later pair of Kraeuter 1923-8 8 inch bent-nose combination pliers, stamped with "Kraeuter" and the model number near the pivot, with "Kraeuter U.S.A." forged into the underside of the handles. The top inset illustrates the bent-nose construction and the "Don't Slip" gripping pattern on the handles. This handle pattern is described by the Kraeuter 1914 design patent #D46,682. The lack of a screwdriver tip on this example indicates production some time after 1929. Fig. 15. Kraeuter 1923-10 10 Inch Bent-Nose Combination Pliers, with Insets for Side View and Marking Detail, ca. 1910-1921. Fig. 15 shows a pair of Kraeuter 1923-10 10 inch bent-nose combination pliers, stamped "Kraeuter & Co." and "Newark, N.J. U.S.A." near the pivot, with "Forged Steel" forged into the underside of the handles. The top inset shows a side view of the pliers, illustrating the bent-nose construction and the older dimpled gripping pattern on the handles. Fig. 16. Kraeuter 1873-7 7 Inch Combination Pliers with Side Cutters, with Insets for Reverse and Side View, ca. 1910-1921. Fig. 16 shows a pair of Kraeuter 1873-7 7 inch slip-joint combination pliers with side cutters, stamped "Kraeuter & Co." and "Newark, N.J. U.S.A." near the pivot, with "Forged Steel" forged into the underside of the handles. These pliers have the Dimple-Diamond gripping pattern on the handles, the earlier of the major handle patterns used by Kraeuter. Fig. 17. Kraeuter 1873-7 7 Inch Combination Pliers with Side Cutters, with Insets for Reverse and Side View, ca. 1910-1921. Fig. 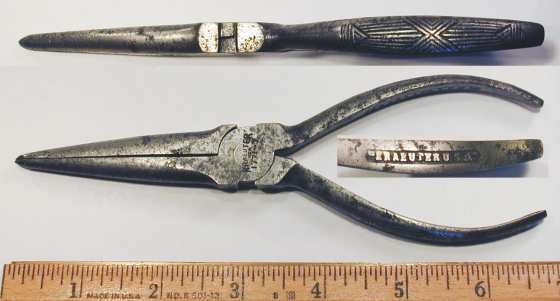 17 shows a similar pair of Kraeuter 1873-7 7 inch slip-joint combination pliers with side cutters, stamped "Kraeuter & Co." and "Newark, N.J. U.S.A." near the pivot, with "Forged Steel" forged into the underside of the handles. On these pliers the stamped markings are oriented transversely to the main axis, compared with the approximately parallel orientation in the previous example. In addition, the pliers have an interesting code "711 0" stamped near the pivot on both pieces, shown as a close-up in the middle right inset. These numbers are partially visible through the holes for the slip-joint, but the pliers must be disassembled to view the full code. The meaning of this code is not yet known, but similar codes have been observed on some other Kraeuter slip-joint pliers. Fig. 18. Kraeuter 1973-5-1/2 5.5 Inch Slip-Joint Combination Pliers, with Insets for Handle Pattern and Detail, ca. 1924 to Late 1930s. Fig. 18 shows a pair of Kraeuter 1973-5-1/2 5.5 inch slip-joint combination pliers with side cutters, stamped with "USA" and the model number near the pivot, with "Grip-Kut Junior" and "Pat. Pending" on the reverse (not shown). The handles have a forged-in "Kraeuter U.S.A." marking on the inside surface, as shown in the lower inset. The patent corresponding to the pending marking has not been found yet. The 1939 Kraeuter catalog lists this model as a combination side cutting plier, and refers to the handle pattern as the "Don't Slip" design. A larger 1973-7 model was also available (see the Kraeuter 1973-7 Pliers), and pliers with smooth handles were available as a 1972 model series. Fig. 19A. Kraeuter 1973-5-1/2 5.5 Inch Slip-Joint Combination Pliers with Side Cutters, with Insets for Reverse, Side View, and Marking Detail, ca. 1942-1945. Fig. 19A shows a later pair of Kraeuter 1973-5-1/2 5.5 inch slip-joint combination pliers with side cutters, stamped with "GripKut Supreme" near the pivot, with "Kraeuter" and the model number on the reverse, and with "Kraeuter U.S.A." forged into the underside of the handles. The overall length is 5.7 inches, and the finish is plain steel, with coarse grinding marks remaining on the surface. The top inset shows a side view of the pliers, illustrating the "Don't Slip" gripping pattern on the handles. Note also that the forging parting line and trimming remnants are visible on the nose of the pliers. The coarse surface and plain finish clearly indicate that these pliers were produced during the 1942-1945 wartime years, when labor shortages and production quotas sometimes forced abbreviated finishing operations. The deeply stamped "D" on the underside of the handles (see lower inset) was probably added to denote government production. The "Supreme" marking indicates that these pliers were part of Kraeuter's select group of pliers retaining the forged handle patterns and finest finish. Fig. 19B. Kraeuter 1973-5-1/2 5.5 Inch Slip-Joint Combination Pliers, with Insets for Reverse and Side View, ca. 1946 to 1950s. Fig. 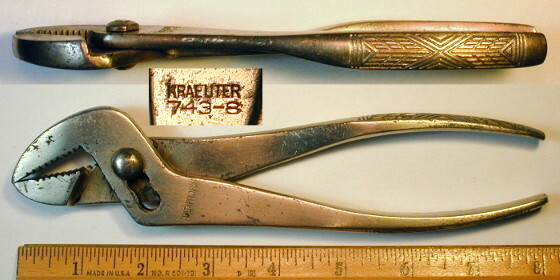 19B shows a later pair of Kraeuter 1973-5.5 5.5 inch slip-joint pliers with side-cutters, stamped with "Kraeuter" and the model number near the pivot. The overall length is 5.9 inches, and the finish is nickel plating. The top inset shows a side view of the pliers, illustrating the simplified version of the "Don't Slip" pattern widely used on earlier models. The undersides of the handles are smoothly finished with no markings. Note that these pliers are fitted with a solid (flush) rivet, a detail mentioned in the 1946 catalog. By this time the model 1973 pliers had obviously been dropped from the "Supreme" line, as the finely forged handle pattern of prior years has been replaced with a simple stamped pattern. Fig. 20. Kraeuter 1973-7 7 Inch Slip-Joint Combination Pliers, with Insets for Reverse and Side View, ca. Early to Mid 1940s. Fig. 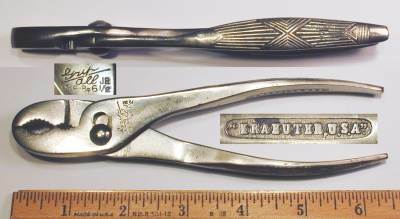 20 shows a later pair of Kraeuter model 1973-7 slip-joint combination pliers with side-cutters, stamped "Kraeuter" and "USA" on the handle. The top inset shows a side view of the pliers, illustrating the simplified gripping pattern based on the earlier "Don't Slip" pattern. By 1946 the model 1973 pliers were being offered with a solid (flush) rivet, indicating somewhat earlier production for this example. Fig. 21. Kraeuter 1973-7 7 Inch Slip-Joint Combination Pliers, with Inset for Handle Pattern, ca. Mid 1940s to 1950s. Fig. 21 shows another later pair of Kraeuter model 1973-7 slip-joint pliers with side-cutters, stamped "USA" on the handle. The inset shows the simplified gripping pattern on the handles, suggesting production from the mid 1940s onward. By 1946 the Kraeuter catalog listed the model 1973 pliers with a solid (flush) rivet, as in the example here, and the description mentions a tapered nose. The next figures show two generations of the model 1903-7 thin-nose combination pliers. Fig. 22A. Kraeuter 1903-7 7 Inch Thin-Nose Combination Pliers, with Insets for Side View and Marking Detail, ca. 1910-1921. Fig. 22A shows an early pair of Kraeuter 1903-7 7 inch thin-nose combination pliers, stamped with "Kraeuter & Co." and "Newark, N.J. U.S.A." near the pivot, with "Forged Steel" forged into the underside of the handles. The overall length is 7.1 inches, and the finish is nickel plating, with losses due to wear. The top inset illustrates the thin jaws of this model. Note the use of the Dimple-Diamond gripping pattern on the handles, the earliest of the major handle patterns used by Kraeuter. The "Newark" marking and Dimple-Diamond gripping pattern suggest production in the range 1910-1921. Fig. 22B. Kraeuter 1903-7 7 Inch Thin-Nose Combination Pliers, with Insets for Side View and Marking Detail, ca. 1924 to Late 1930s. Fig. 22B shows a later pair of Kraeuter 1903-7 7 inch thin-nose combination pliers, stamped with "Kraeuter" and the model number near the pivot, with "Kraeuter U.S.A." forged into the underside of the handles. The overall length is 7.1 inches, and the finish is nickel plating. The top inset shows a side view of the pliers, illustrating the thin jaws and "Don't Slip" gripping pattern. This example has a screwdriver tip on one handle, a feature that was still offered in 1934 but had been discontinued by 1939. The next figures show two generations of the Kraeuter 1913-7 pliers, with some unexpected differences in construction and markings. Fig. 23A. Kraeuter 1913-7 7 Inch Bent Thin-Nose Combination Pliers, with Insets for Reverse, Side View, and Marking Detail, ca. 1922-1924. Fig. 23A shows a pair of Kraeuter 1913-7 7 inch bent thin-nose combination pliers, stamped with "Kraeuter & Co." and "Newark, N.J. U.S.A." near the pivot. 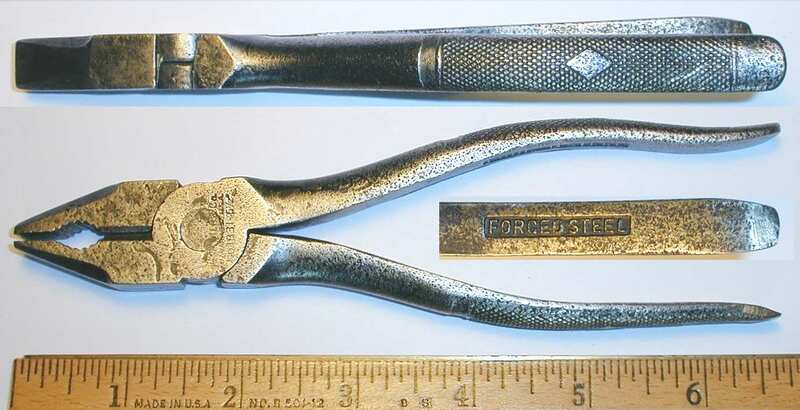 These pliers have rare mixed markings on the undersides of the handles, with "Forged Steel" forged into the underside of one handle and "Kraeuter U.S.A." forged into the other. The overall length is 7.0 inches, and the finish is nickel plating, with extensive losses due to rust. The top inset shows a side view of the pliers, illustrating the bent thin jaws of this model and the older Dimple-Diamond gripping pattern. These pliers have an unusual combination of markings and construction, with the use of the older Dimple-Diamond gripping pattern, but with "Kraeuter U.S.A." forged into one handle. More commonly the gripping pattern had been changed to the newer "Don't Slip" pattern by the time the "Kraeuter U.S.A." forged-in marking came into use. 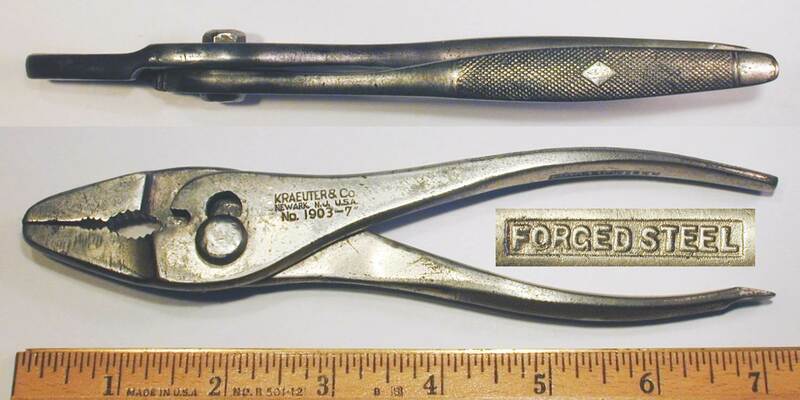 These pliers may represent an early test of the forged-in "Kraeuter U.S.A." marking, which later became the standard. Fig. 23B. Kraeuter 1913-7 7 Inch Bent Thin-Nose Combination Pliers, with Insets for Side View and Marking Detail, ca. 1924 to Mid 1920s. Fig. 23B shows a somewhat later pair of Kraeuter 1913-7 7 inch bent thin-nose combination pliers, stamped with "Kraeuter & Co." and "Newark, N.J. U.S.A." near the pivot, with "Kraeuter U.S.A." forged into the underside of the handles. The overall length is 7.1 inches, and the finish is nickel plating, with extensive losses due to rust. The top inset shows a side view of the pliers, illustrating the bent thin jaws of this model and the "Don't Slip" gripping pattern. These pliers have an unusual combination of markings, with both "Newark, N.J." stamped on the side and "Kraeuter U.S.A." forged into the handles. Previously we had thought that the Newark marking had been discontinued before the "Kraeuter U.S.A." marking was adopted, but this example shows that there was some overlap. Fig. 23C. Kraeuter 1933-5-1/2 5.5 Inch Thin-Nose Combination Pliers, with Insets for Side View and Marking Detail, ca. 1924 to Late 1930s. Fig. 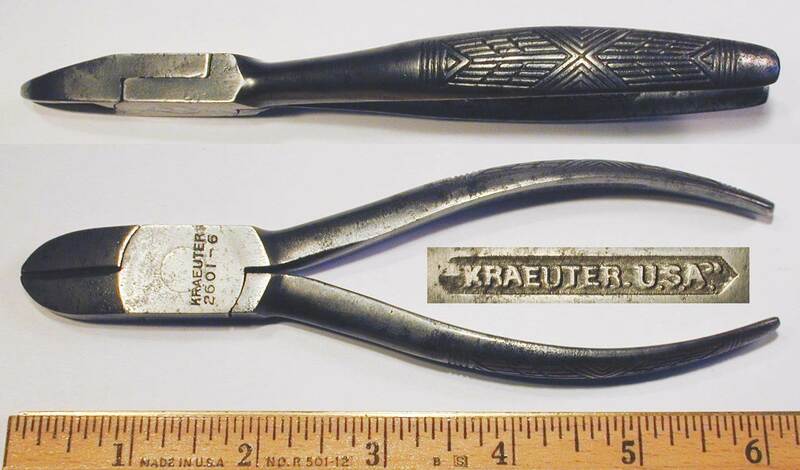 23C shows a pair of Kraeuter 1933-5-1/2 5.5 inch thin-nose combination pliers, stamped with "Kraeuter" and the model number near the pivot, with "Kraeuter U.S.A." forged into the underside of the handles. The overall length is 5.3 inches, and the finish is nickel plating, with losses due to wear. 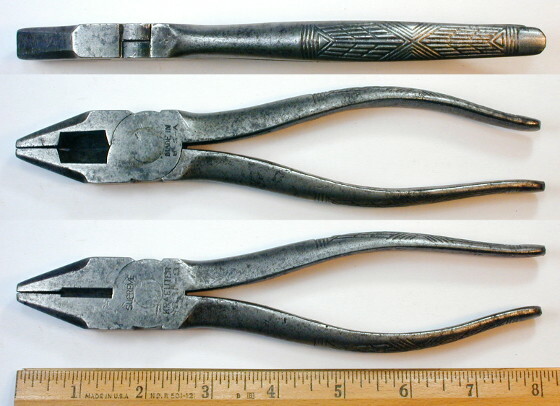 The top inset shows a side view of the pliers, illustrating the thin jaws and "Don't Slip" gripping pattern on the handles. Kraeuter's angle-nose (or "Sure-Grip") pliers were introduced some time after 1929, probably in response to the popularity of Wilde's "Wrench" Pliers. 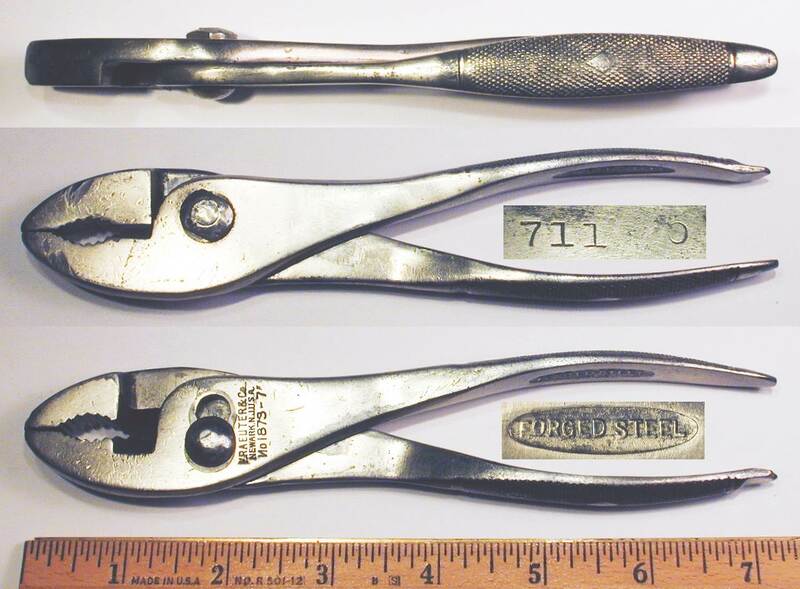 The 1934 catalog listed Model 743 "Sure-Grip" pliers in three sizes, 6, 7, and 8 inches, with a nickel-plated finish. Fig. 24. Kraeuter 743-7 7 Inch Angle-Nose Pliers, with Insets for Side View and Reverse Detail, ca. Mid 1940s to 1950s. Fig. 24 shows a pair of Kraeuter 743-7 7 inch slip-joint angle-nose pliers, stamped with "Kraeuter" and "USA" on the reverse. The overall length is 7.4 inches fully extended, and the finish is plain steel. The top inset shows a side view of the pliers, illustrating the simplified gripping pattern on the handles. The next figures show two generations of the Kraeuter 743-8 pliers. Fig. 25. Kraeuter 743-8 8 Inch Angle-Nose Pliers, with Insets for Side View and Reverse Detail, ca. Early 1930s. Fig. 25 shows a pair of Kraeuter 743-8 8 inch slip-joint angle-nose pliers, stamped with "Pat Appld For" on the handle, with "Kraeuter" and "743-8" on the reverse (see center inset). The overall length is 8.3 inches fully extended, and the finish is nickel plating. The top inset shows a side view of the pliers, illustrating the "Don't Slip" gripping pattern. These pliers are unusual in that the expected forged-in "Kraeuter U.S.A." handle marking is not present. One possibility is that they were intended for potential contract production with only stamped markings. Kraeuter is not known to have a patent on angle-nose pliers. The patent applied notation suggests that these might be early production of this model, and that Kraeuter hoped to patent some feature. These considerations lead to an estimated production date in the early 1930s. Fig. 26. Kraeuter 743-8 8 Inch Angle-Nose Pliers, with Insets for Side View and Reverse Detail, ca. 1942-1945. Fig. 26 shows a later pair of Kraeuter 743-8 8 inch slip-joint angle-nose pliers, stamped "USA" on the handle, with the company name and model number on the reverse. The plain handles on these pliers may indicate wartime production, as knurled handles were standard as late as 1959. 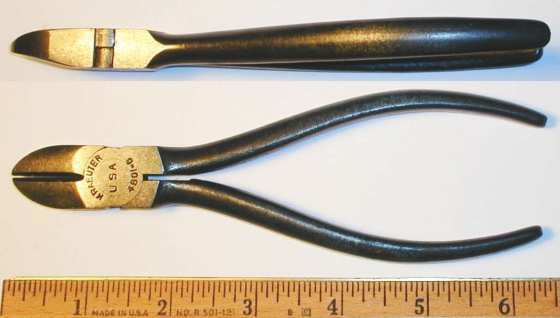 The standard "gas and burner" plier design incorporated rounded gripping surfaces for holding pipes, plus a smaller grip on the nose for adjusting burners. These models were generally made with a fixed pivot, and an example of the standard design can be seen in the Utica 1300 Gas and Burner Pliers. Kraeuter's model 1863 gas and burner pliers departed from the standard by using slip-joint construction, making them more like combination pliers. 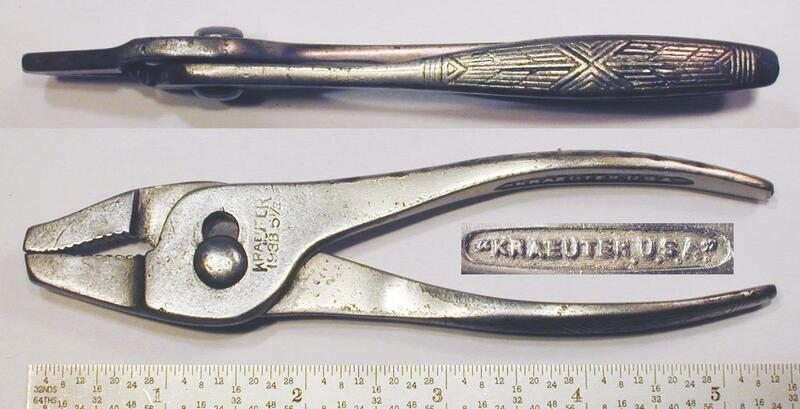 By 1920 or so Kraeuter was using "Grip-All" as a trade name for its gas and burner pliers. By 1934 the model 1863 pliers appear to have been discontinued, as they are no longer listed in the catalog from that year. Fig. 27. Kraeuter 1863-9 "Grip-All" 9 Inch Slip-Joint Gas and Burner Pliers, with Inset for Handle Pattern, ca. 1924 to Late 1920s. Fig. 27 shows a pair of Kraeuter 1863-9 "Grip-All" 9 inch gas and burner pliers in an unusual slip-joint configuration, stamped with "Grip All" and the model number near the pivot, with "Kraeuter U.S.A." forged into the underside of the handles. The overall length is 8.9 inches, and the finish is nickel plating. 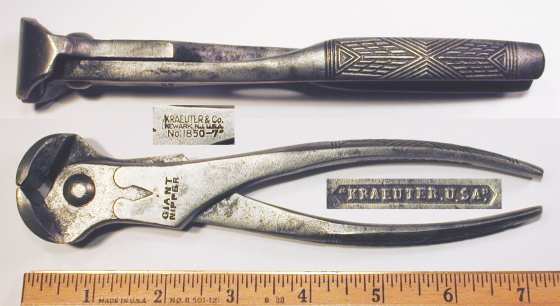 The Kraeuter 1863-9 pliers were listed in the 1922 C.W. Marwedel industrial catalog, at a price of $18.20 per dozen. Fig. 28. Kraeuter 1863-9 "Grip-All" 9 Inch Slip-Joint Gas and Burner Pliers, with Inset for Side View, ca. Early 1930s. Fig. 28 shows a somewhat later pair of Kraeuter 1863-9 9 inch slip-joint gas and burner pliers, stamped with "Grip-All" and the model number near the pivot, with "Kraeuter U.S.A." forged into the underside of the handles. The overall length is 8.8 inches, and the finish is nickel plating. Note that these pliers do not have the screwdriver tip seen in the previous figure, indicating a manufacturing date sometime after 1929. The next two figures show examples of gas-and-burner pliers in the 6.5 inch size, termed "Grip-All Jr". Fig. 30. 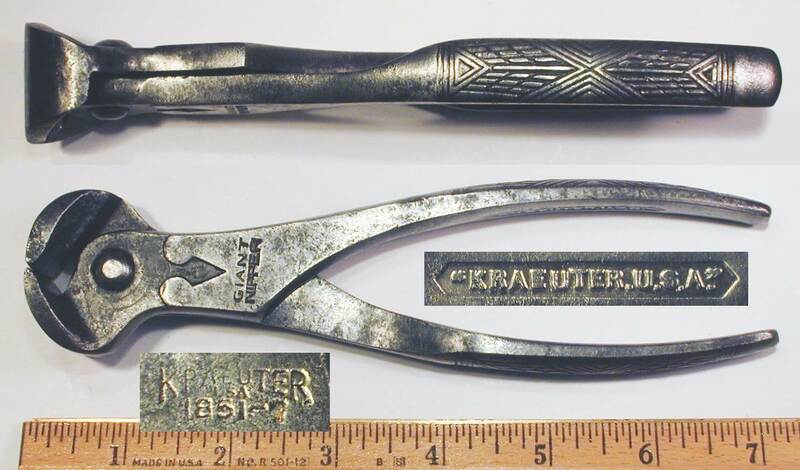 Kraeuter 1863-6-1/2 6.5 Inch Slip-Joint Gas and Burner Pliers, with Insets for Side View and Marking Detail, ca. 1924 to Early 1930s. Fig. 30 shows a pair of Kraeuter 1863-6-1/2 6.5 inch slip-joint gas and burner pliers, marked with "Grip-All Jr" and the model number near the pivot, and with "Kraeuter U.S.A." forged into the underside of the handles. The top inset shows the "Don't Slip" gripping pattern on the handles. The 1863 pliers in this 6.5 inch size did not provide a wire cutting slot or screwdriver tip. Fig. 29. Kraeuter 1863-6-1/2 6.5 Inch Slip-Joint Gas and Burner Pliers, with Insets for Side View and Marking Detail, ca. 1942-1945. Fig. 29 shows a pair of Kraeuter 1863-6-1/2 6.5 inch slip-joint gas and burner pliers, stamped with "Grip-All Jr" and the model number near the pivot. The overall length is 6.4 inches, and the finish is plain steel, with coarse grinding marks remaining on the surface. The coarse surface and plain finish indicate production during the 1942-1945 wartime years. The underside of the handles of these pliers is smooth, without the "Kraeuter U.S.A." marking found on earlier production. Kraeuter began omitting this marking on some models during the 1930s. Fig. 31. Kraeuter 1801-6 6 Inch Lineman's Pliers, with Insets for Side View and Reverse Detail, ca. 1920-1924. Fig. 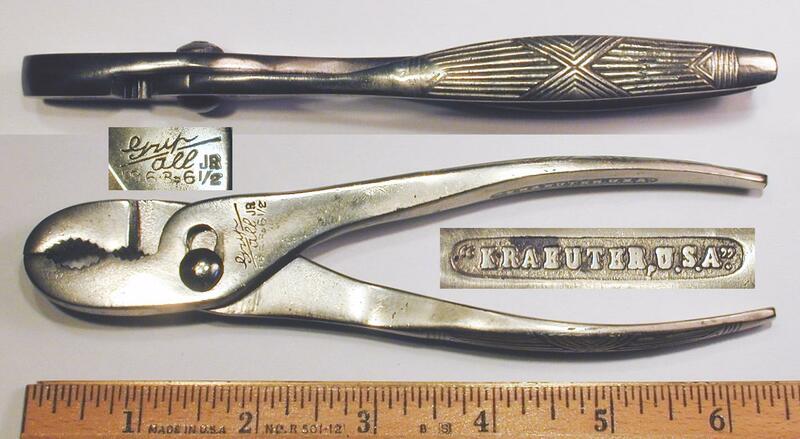 31 shows a pair of Kraeuter 1801-6 6 inch lineman's pliers, stamped "Kraeuter & Co." and "Made in U.S.A." over the pivot. The handles are also marked with "Forged Steel" forged into the underside, shown as a close-up in the lower inset. The upper inset shows a side view of the pliers, illustrating the dimpled handle pattern with the central diamond. Fig. 32. Kraeuter 1801-7 7 Inch Lineman's Pliers, with Insets for Reverse, Side View and Marking Detail, ca. 1924 to Late 1930s. Fig. 32 shows a pair of Kraeuter 1801-7 lineman's pliers, stamped with "Kraeuter" and the model number over the pivot, and with "Kraeuter U.S.A." forged into the underside of the handles (see lower inset). The top inset shows a side view of the pliers, illustrating the Kraeuter "Don't Slip" gripping pattern on the handles. This design is covered by the Kraeuter 1914 patent #D46,682. Fig. 33. Kraeuter 1801-8-1/2 8.5 Inch Lineman's Pliers, with Insets for Side View and Marking Detail, ca. 1910-1921. Fig. 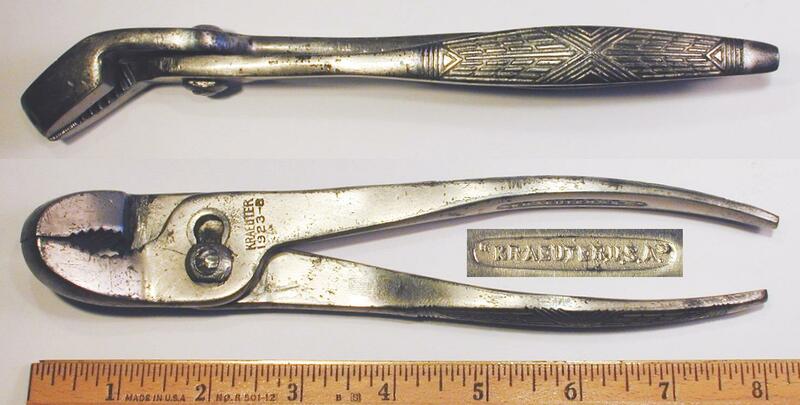 33 shows an earlier pair of Kraeuter 1801-8 1/2 lineman's pliers, stamped "Kraeuter & Co." and "Newark, N.J. U.S.A." over the pivot (see lower inset). A forged-in marking "Forged Steel" appears on the underside of the handles, as shown in the middle inset. The overall length is 8.6 inches, and the finish is black oxide. Fig. 34. Kraeuter 1801-8-1/2 Lineman's Pliers, with Inset for Side View, ca. Mid 1940s to 1950s. Fig. 34 shows a much later example of the Kraeuter 1801-8 1/2 pliers, stamped with the company name and "USA" over the pivot. The circular marking style indicates production from the mid 1940s onward. By 1946 the model 1801 pliers were part of the "Industrial" line, with a simplified finish. Fig. 35. Kraeuter 1831-6-1/2 6.5 Inch Lineman's Pliers, with Insets for Side View and Marking Detail, ca. 1910-1920. Fig. 35 shows a pair of Kraeuter 1831-6-1/2 6.5 inch lineman's or electrician's pliers, marked "Kraeuter & Co." and "Newark, N.J. U.S.A." near the pivot, and with "Forged Steel" forged into the underside of the handles. 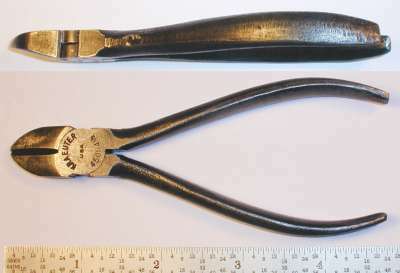 The top inset shows a side view of the pliers, to illustrate the head design and handle pattern. The dimpled handle with a raised diamond logo (called simply "knurled handles" in catalogs) is believed to be Kraeuter's earliest handle pattern. This model was listed in the 1925 Dunham Catalog in nominal sizes of 4, 5, 6-1/2, 7, and 8 inches. Fig. 36A. Kraeuter 1831-7 7 Inch Lineman's Pliers, with Insets for Side View and Marking Detail, ca. 1924 to Late 1930s. Fig. 36A shows a pair of Kraeuter 1831-7 7 inch lineman's pliers, stamped with "Kraeuter" and the model number near the pivot, and with "Kraeuter U.S.A." forged into the underside of the handles. Fig. 36B. Kraeuter 1831-8 8 Inch Lineman's Pliers, with Insets for Reverse and Side View, ca. 1945 to Late 1940s. Fig. 36B shows a pair of Kraeuter 1831-8 "Supreme" 8 inch lineman's pliers, stamped "Supreme" with "Kraeuter" and the model number near the pivot, with "Made in U-S-A" on the reverse. The overall length is 8.0 inches, and the finish is black oxide. The top inset shows a side view of the pliers, illustrating the "Don't Slip" gripping pattern on the handles. These pliers do not have the "Kraeuter U.S.A." marking forged into the underside of the handles. Kraeuter's 1946 catalog lists the model 1831 pliers as part of the "Supreme" line, suggesting a post-war production date. Fig. 37. 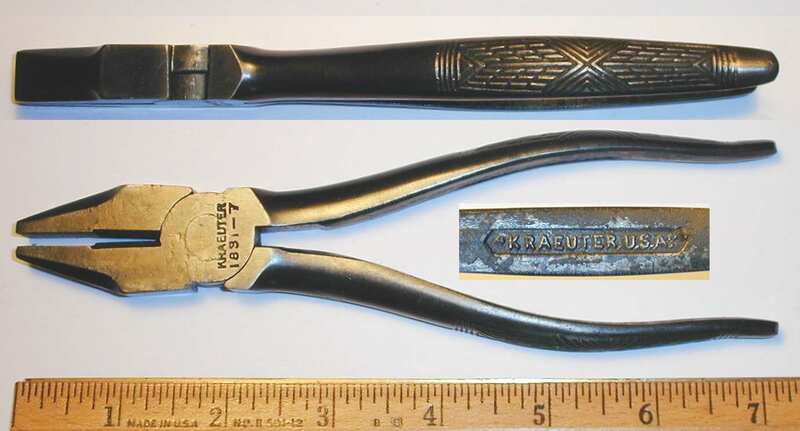 Kraeuter 1834-6 1/2 6.5 Inch Lineman's Pliers, with Insets for Side View and Marking Detail, ca. 1910-1920. Fig. 37 shows a pair of Kraeuter 1834-6 1/2 6.5 inch lineman's pliers, stamped "Kraeuter & Co." and "Newark, N.J. U.S.A." near the pivot, and with "Forged Steel" forged into the underside of the handles. Fig. 38. 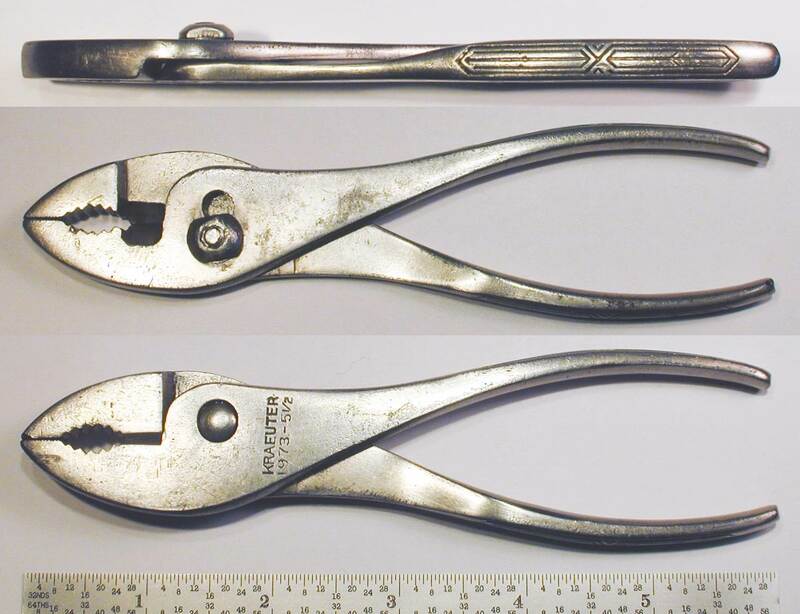 Kraeuter Early [2801-6] "Dreadnought" 6 Inch Lineman's Pliers, with Insets for Reverse, Side View, and Marking Detail, ca. 1914. Fig. 38 shows an early pair of Kraeuter [2801-6] "Dreadnought" 6 inch lineman's pliers, stamped with "Dreadnought" partially legible across the pivot, with "Kraeuter & Co." and "Newark, N.J. U.S.A." on the reverse face. The handles of the pliers are marked with "Forged Nickel Steel" forged into the undersides (see lower right inset). The reverse face is also stamped with a "Pat's Pending" patent notice, believed to be a reference to the Kraeuter 1914 design patent #D46,682 describing the "Don't Slip" gripping pattern on the handles. This handle design was apparently first used for the model 2801 "Dreadnought" pliers, as a 1916 catalog from Central Auto Supply shows the 2801 pliers with the "Don't Slip" pattern, but other Kraeuter pliers with the older Dimple-Diamond pattern. 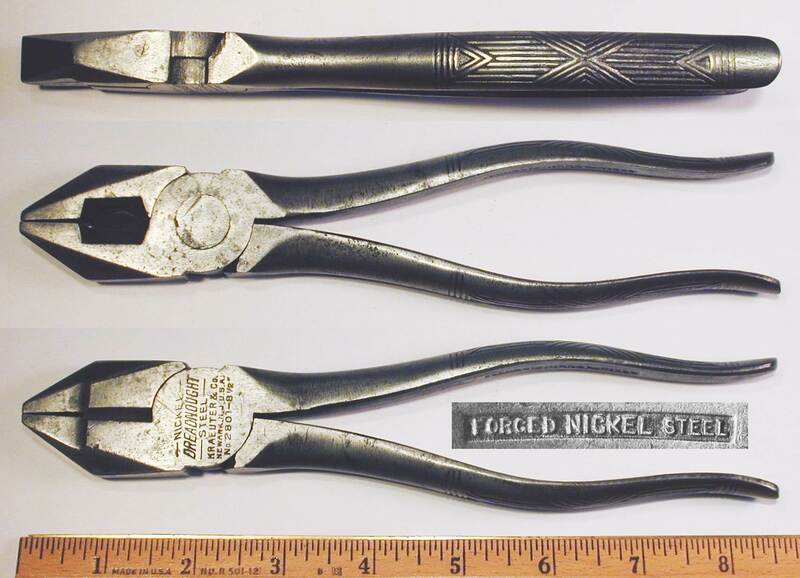 The use of nickel steel in these 1914 pliers is currently our earliest reference to the usage of alloy steel in hand tools. The next two figures show two generations of the Kraeuter 2801 "Dreadnought" lineman's pliers in the 7 inch size. Fig. 39. 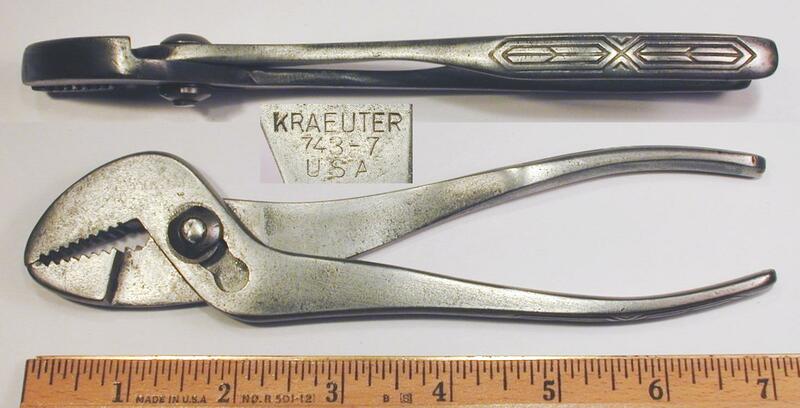 Kraeuter 2801-7 "Dreadnought" 7 Inch Lineman's Pliers, with Insets for Reverse, Side View and Marking Detail, ca. 1914-1921. Fig. 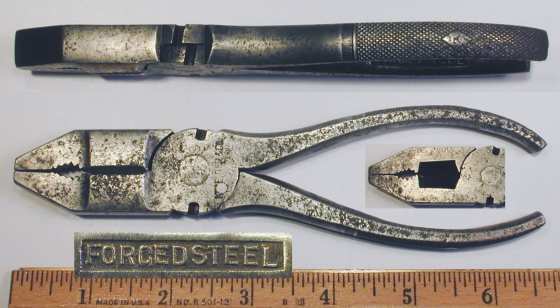 39 shows an earlier pair of Kraeuter 2801-7 "Dreadnought" 7 inch lineman's pliers, stamped "Dreadnought" and "Nickel Steel" over the pivot, with "Kraeuter & Co." and "Newark, N.J. U.S.A." below. The handles are also marked with "Forged Nickel Steel" forged into the undersides (see lower inset). The top inset shows the "Don't Slip" gripping pattern on the handles, a design covered by the Kraeuter 1914 patent #D46,682. This handle design was actually first used for the 2801 "Dreadnought" pliers and appeared in catalogs as early as the 1916 (Central Auto Supply), a time when other Kraeuter plier models were using the older Dimple-Diamond pattern. The "Newark" and "Forged Nickel Steel" markings with the "Don't Slip" gripping pattern suggest production in the range 1914-1921. 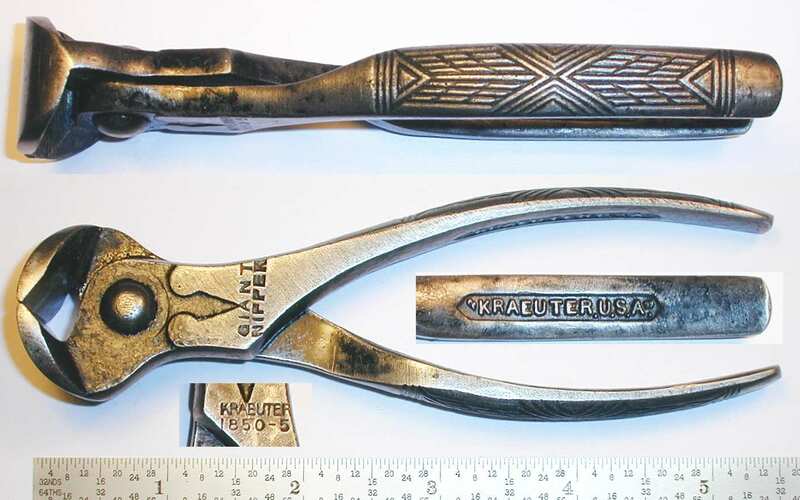 The Kraeuter "Dreadnought" pliers are notable as very early examples of the use of nickel alloy steel in hand tools. Fig. 40. Kraeuter 2801-7 "Dreadnought" 7 Inch Lineman's Pliers, with Insets for Side View and Reverse Detail, ca. 1924 to Late 1930s. Fig. 40 shows a pair of Kraeuter 2801-7 "Dreadnought" 7 inch lineman's pliers, stamped "Dreadnought" and "Nickel Steel" over the pivot, and with "Kraeuter U.S.A." forged into the underside of the handles. These pliers have the Kraeuter "Don't Slip" gripping pattern on the handles, a design covered by the Kraeuter 1914 patent #D46,682. This handle design was actually first used for the 2801 "Dreadnought" pliers and appeared in catalogs as early as the 1916 (Central Auto Supply), a time when other Kraeuter plier models were using the older Dimple-Diamond pattern. Fig. 41. Kraeuter 2801-8-1/2 "Dreadnought" 8.5 Inch Lineman's Pliers, with Insets for Side View and Reverse Detail, ca. 1914 to 1921. Fig. 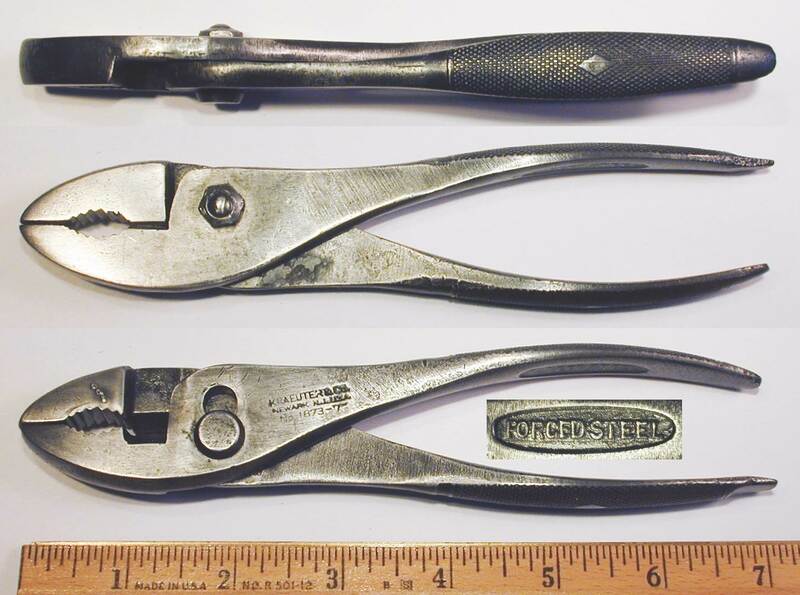 41 shows a pair of Kraeuter 2801-8-1/2 "Dreadnought" 8.5 inch lineman's pliers, stamped "Dreadnought" and "Nickel Steel" over the pivot, with "Kraeuter & Co." and "Newark, N.J. U.S.A." below. The handles are also marked with "Forged Nickel Steel" forged into the undersides. Kraeuter also produced a model 1821 series of "universal combination" pliers that are similar to the lineman's style. The next figures show several generations of the Kraeuter 1821 pliers in various sizes and with different handle patterns. Fig. 42. Kraeuter 1821[-7-1/2] 7.5 Inch Lineman's "Universal Combination" Pliers, with Insets for Side View, Construction, and Marking Detail, ca. 1910-1921. Fig. 42 shows an earlier pair of the Kraeuter 1821[-7-1/2] 7.5 inch lineman's "Universal Combination" pliers, incorporating flat and rounded gripping surfaces, side cutters, Button's cutters, and originally awl and screwdriver tips on the handles. (The handle tips have been broken off on this example.) 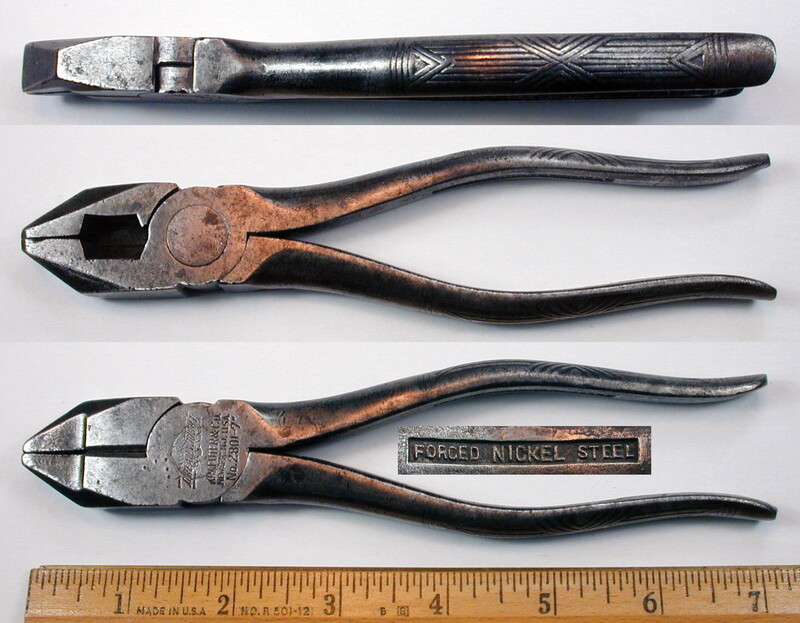 The pliers are stamped "Kraeuter & Co." near the pivot, with the likely "Newark, N.J. U.S.A." marking only partially visible. The handles are also marked with "Forged Steel" forged into the underside, shown as a close-up in the lower inset. The current overall length is 6.6 inches, but with the handle tips the original length was likely 7.3 inches. The finish is plain steel, with extensive pitting due to rust. These pliers were made with the "Dimple-Diamond" gripping pattern used by Kraeuter as its earlier handle pattern. The handle pattern is paired with a "Forged Steel" marking on the underside of the handles. 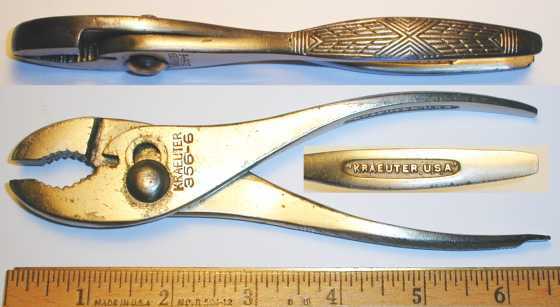 Note that these pliers were fitted with a limit pin, visible as the small circle obstructing the "RA" in the "KRAEUTER" marking. This pin was used to limit the opening of the pliers so that the Button's cutting slots come into alignment, although in this example the limit pin has been broken (or worn off) so that the pliers open fully. The limit pin feature was also noted on the Kraeuter Early 1821 Universal Combination Pliers shown in another figure. Fig. 43. Kraeuter 1821[-7-1/2] 7.5 Inch Lineman's "Universal Combination" Pliers, with Insets for Side View, Construction, and Marking Detail, ca. 1920-1921. Fig. 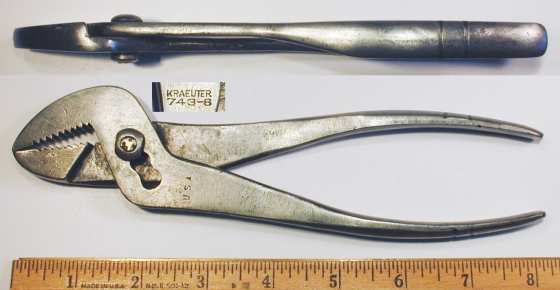 43 shows a somewhat later pair of the Kraeuter 1821[-7-1/2] 7.5 inch lineman's "Universal Combination" pliers, incorporating flat and rounded gripping surfaces, side cutters, Button's cutters, and an awl tip on the handle. (The other handle should have had a screwdriver tip, but it has been broken off or removed.) 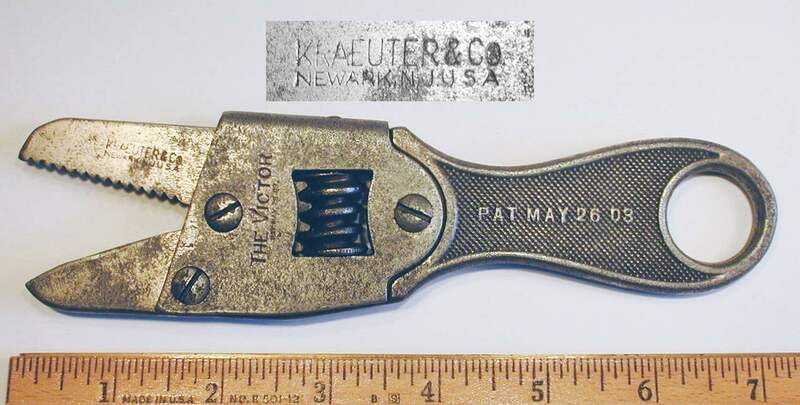 The pliers are stamped "Kraeuter & Co." and "Newark, N.J. U.S.A." near the pivot, with the model number "No. 18??" only partially readable. The handles are also marked with "Forged Steel" forged into the underside. Fig. 44. Kraeuter 1821-7-1/2 7.5 Inch Lineman's "Universal Combination" Pliers, with Insets for Side View and Marking Detail, ca. 1920-1921. Fig. 44 shows another pair of the Kraeuter 1821-7-1/2 7.5 inch lineman's "Universal Combination" pliers in better condition. The jaws incorporate both flat and rounded gripping surfaces, side cutters, and Button's cutting slots, and the handles include an awl tip and a screwdriver blade. The pliers are stamped "Kraeuter & Co." and "Newark, N.J. U.S.A." near the pivot, with the model number as "No. 1821-7 1/2" below (see middle inset). The handles are also marked with "Forged Steel" forged into the underside, as shown in the lower inset. The use of the Newark marking together with the later variant of the "Don't Slip" pattern suggests a production date around 1920-1921. Fig. 45. Kraeuter 1821-8 8 Inch Lineman's "Universal Combination" Pliers, with Insets for Side View, Reverse Detail, and Marking Detail, ca. 1922-1924. Fig. 45 shows a pair of the Kraeuter 1821-8 8 inch lineman's "Universal Combination" pliers, stamped with "Kraeuter" and the model number across the pivot. The handles are also marked with "Forged Steel" forged into the underside, as shown in the lower inset. The overall length is 7.8 inches, and the finish is plain steel, with extensive pitting due to rust. The gripping pattern on these pliers is a variant of the "Don't Slip" pattern, described by the design patent #D59,602, filed by A.A. Kraeuter in 1920 and issued in 1921. The features of this model include both flat and rounded gripping surfaces, side cutters, Button's cutting slots, and awl and screwdriver tips on the handles. Fig. 46. Kraeuter 1821-5-1/2 5.5 Inch Lineman's "Universal Combination" Pliers, with Insets for Side View, Construction, and Marking Detail, ca. 1924 to Late 1930s. Fig. 46 shows a later pair of the Kraeuter 1821-5-1/2 5.5 inch lineman's "Universal Combination" pliers, incorporating flat and rounded gripping surfaces, Button's cutters, and screwdriver and awl tips on the handles. The pliers are marked with "Kraeuter" and the model number near the pivot, and with "Kraeuter U.S.A." forged into the underside of the handles. The overall length is 5.5 inches, and the finish is polished steel, with some pitting due to rust. 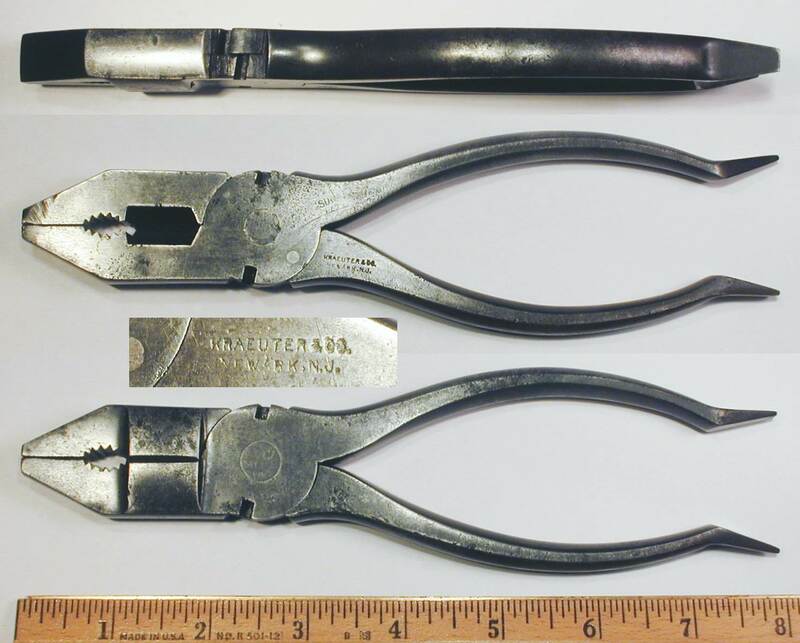 The handle pattern on these pliers is a 1921 variant of the familiar Kraeuter "Don't Slip" pattern, described by the later design patent #D59,602, filed by A.A. Kraeuter in 1920 and issued in 1921. Button's Pattern pliers were a style of wire-cutters first introduced by J.M. King & Company in the late 1860s. These pliers were typically produced with two or three wire-cutting slots situated at the sides or between the jaws. Button's pliers were very popular during the 19th century and remained in production through at least the mid 20th century. 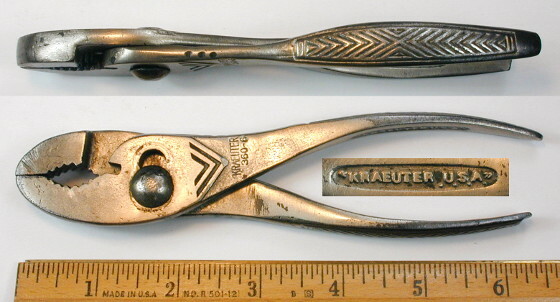 Kraeuter's most popular Button's pliers were the 1841 model series, which remained in production from around 1910 (or earlier) until at least the 1940s. The 1841 pliers had two distinctive production features not found in pliers from other makers, the first of which is that the cutting slot between the jaws was set at a right angle to the faces. Pliers from other makers (including the original J.M. King pliers) typically set the slot at an angle to the faces. This feature continued until around the mid to late 1940s, but later versions of the pliers have been observed with an angled slot. The other distinctive Kraeuter feature is that the angled edge of the head was ground with a curved surface, rather than the flat surface used by other makers. The curve in this surface can be seen in the transition where the angled edge meets the parallel sides of the head, appearing as a curved transition from dark to light in a side view of the pliers. This feature is best illustrated in the top inset of the Kraeuter 1841-10 Button's Pliers, but present in all known examples of this model series. Fig. 47. 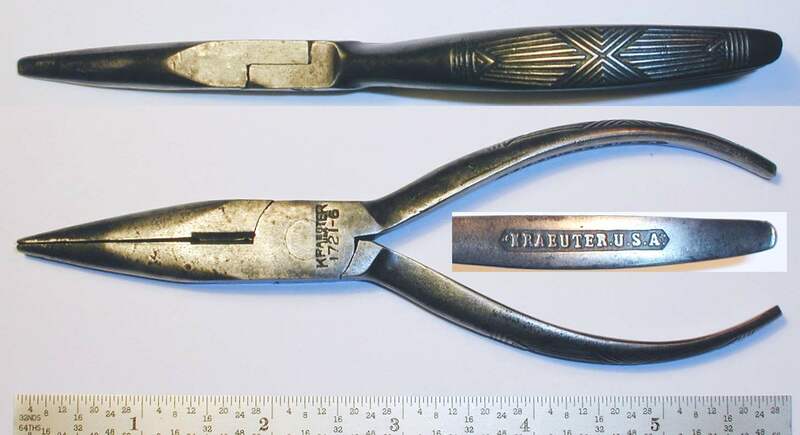 Kraeuter 1841-6-1/2 6.5 Inch Button's Pattern Pliers, with Insets for Side View and Marking Detail, ca. 1910-1921. Fig. 47 shows an early pair of Kraeuter 1841-6-1/2 Button's Pattern pliers in the 6.5 inch size, stamped "Kraeuter & Co." and "Newark, N.J. U.S.A." near the pivot, and with "Forged Steel" forged into the underside of the handles. The top inset shows a side view of the pliers, illustrating the "Dimple-Diamond" gripping pattern on the handles. This was the earliest handle pattern used by Kraeuter. The middle left inset shows a close-up of the jaw construction, illustrating a detail peculiar to the Kraeuter Button's pliers. Note that the center cutting slot is oriented at a right angle to the face of the pliers, in contrast to the slightly angled slot found on the original J.M. King Button pliers. The next two figures show examples of the 1841 "Button's Pattern" pliers. Fig. 48. Kraeuter 1841-8 8 Inch Button's Pattern Pliers, with Insets for Side View and Marking Detail, ca. 1910-1921. Fig. 48 shows an early pair of Kraeuter  8 inch "Button's Pattern" pliers, marked "Kraeuter & Co." near the pivot, and with "Forged Steel" forged into the underside of the handles. The handle pattern has a dimpled background with a central diamond, and the diamond is stamped with the Kraeuter "K" initial. 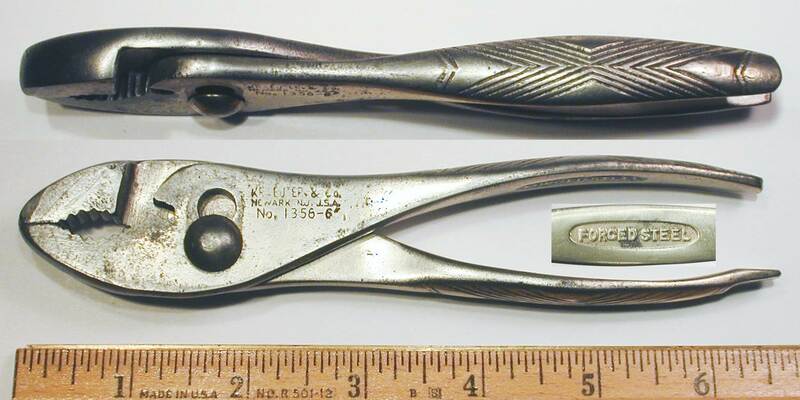 The model number is not marked on this early example, but these pliers are listed as Model 1841-8 "Button's Pattern" pliers in Kraeuter catalog No. 15 and others. The Button's design featured both flat and rounded gripping surfaces, plus three cutting notches at the sides and center. Fig. 49. Kraeuter 1841-8 8 Inch Button's Pattern Pliers, with Insets for Side View and Marking Detail, ca. 1910-1921. Fig. 49 shows another early example of the Kraeuter 1841-8 "Button's Pattern" pliers, marked "Kraeuter & Co." and "Newark, N.J. U.S.A." near the pivot (see lower inset), and with "Forged Steel" forged into the underside of the handles. The handle pattern has a dimpled background with a raised central diamond. The next figures show two generations of the Kraeuter 1841 pliers in the 10 inch size. Fig. 50. Kraeuter 1841-10 10 Inch Button's Pattern Pliers, with Insets for Side View and Construction Detail, ca. 1910-1921. Fig. 50 shows an earlier pair of Kraeuter 1841-10 10 inch "Button's Pattern" pliers, stamped with "Kraeuter & Co" and "Newark, N.J. U.S.A." near the pivot, and with "Forged Steel" forged into the underside of the handles. The overall length is 9.8 inches, and the finish is black oxide on polished steel. The middle left inset shows a close-up of the jaw construction, illustrating a detail peculiar to the Kraeuter Button's pliers. Note that the center cutting slot is oriented at a right angle to the face of the pliers (parallel to the jaws), in contrast to the slightly angled slot found on the original J.M. King Button pliers. Fig. 51 shows a later pair of Kraeuter 1841-10 10 inch "Button's Pattern" pliers, stamped with "Kraeuter" and the model number near the pivot, and with "Kraeuter U.S.A." forged into the underside of the handles. These pliers have the Kraeuter "Don't Slip" gripping pattern on the handles, a design covered by the Kraeuter 1914 patent #D46,682. The middle inset shows a close-up of the jaw construction, illustrating a detail peculiar to the Kraeuter Button's pliers. Note that the center cutting slot is oriented at a right angle to the face of the pliers (parallel to the jaws), in contrast to the slightly angled slot found on the original J.M. King Button pliers. Kraeuter's use of the right-angle slot between the jaws is an important detail and will be helpful in identifying Kraeuter's contract production. This next figure shows an example of the later construction of the model 1841 pliers. Fig. 52. Later Kraeuter 1841-8 8 Inch Button's Pattern Pliers, with Insets for Side View and Marking Detail, ca. Mid 1940s to 1950s. Fig. 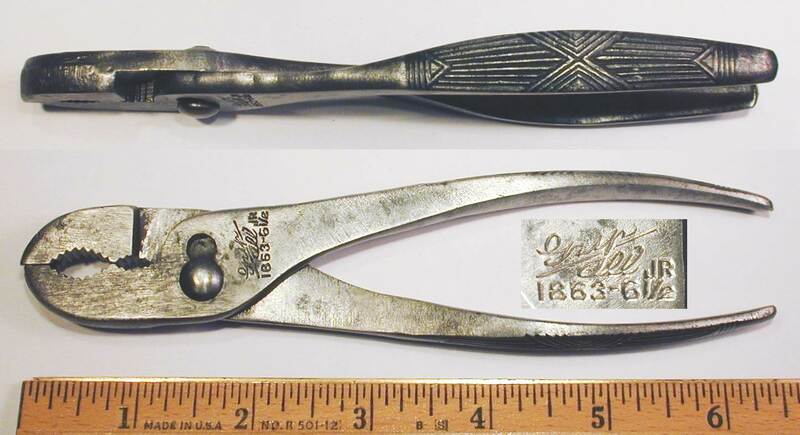 52 shows a later pair of Kraeuter 1841-8 8 inch "Button's Pattern" pliers, stamped with "Kraeuter" and the model number around the pivot, with "USA" in the center. These pliers have plain handles, without the gripping pattern found on the earlier examples. There also are no markings on the underside of the handles. The middle left inset shows a close-up of the cutting slot between the jaws. Note that on these later pliers the slot is at an angle to the jaws. The circular marking style indicates production from the mid 1940s or later. The model 1841 pliers were part of Kraeuter's "Industrial" line from the mid 1940s onward. Fig. 53. Kraeuter 1880-10-1/2 Fencing Pliers, with Insets for Side View, Construction, and Marking Detail, ca. 1910-1920. Fig. 53 shows an early pair of Kraeuter 1880-10-1/2 fencing pliers with Button's style cutters, stamped "Kraeuter & Co." and "Newark, N.J. U.S.A." near the pivot, and with "Forged Steel" forged into the underside of the handles. The next several figures show examples of Kraeuter's 1850 series of end nippers. 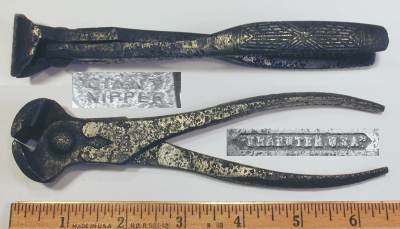 Kraeuter offered end nippers in the 1850 and 1851 model series, which were identical except for the finish, which was black paint and "Kraeuter Finish", respectively. Fig. 54. Kraeuter 1850-5 "Giant Nipper" 5 Inch End Nippers, with Insets for Side View and Marking Detail, ca. 1924 to Late 1930s. Fig. 54 at the left shows a pair of Kraeuter 1850-5 5 inch end nipper pliers, somewhat amusingly marked as "Giant Nipper" near the pivot, and with "Kraeuter" and the model number on the reverse. The handles have "Kraeuter, U.S.A." forged into the underside (see middle inset). The overall length is 5.5 inches, and the finish is black paint. The top inset illustrates the Kraeuter "Don't Slip" geometric gripping pattern on the handles. This pattern was registered as design patent #D46,682, issued to A.A. Kraeuter in 1914. Fig. 55. Kraeuter 1850-6 "Giant Nipper" 6 Inch End Nippers, with Insets for Side View and Reverse Detail, ca. 1924 to Late 1930s. Fig. 55 shows a pair of Kraeuter 1850-6 6 inch end nippers, stamped with "Kraeuter" and the model number near the pivot, with "Giant Nipper" on the reverse. The handles are also marked with "Kraeuter U.S.A." forged into the underside. The overall length is 6.4 inches. The finish is plain steel, with extensive pitting due to rust. The next figures show two generations of the 1850-7 end nippers. Fig. 56. 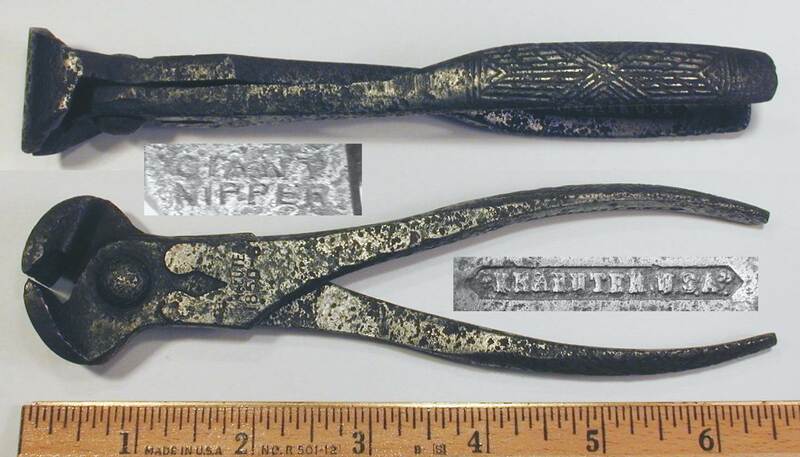 Kraeuter 1850-7 "Giant Nipper" 7 Inch End Nippers, with Insets for Side View and Reverse Detail, ca. 1910 to 1920. Fig. 56 shows an earlier pair of Kraeuter 1850-7 7 inch end nippers, stamped with "Giant Nipper" near the pivot, with "Kraeuter & Co." and "Newark N.J. U.S.A." on the reverse (see middle inset). The handles are also marked with "Forged Steel" forged into the underside. The overall length is 6.9 inches, and the finish is plain steel with traces of black paint. The top inset shows a side view of the pliers, illustrating the "Dimple-Diamond" gripping pattern on the handles. Fig. 57A. Kraeuter 1850-7 "Giant Nipper" 7 Inch End Nippers, with Insets for Side View and Reverse Detail, ca. 1920-1924. Fig. 57A shows a somewhat later pair of Kraeuter 1850-7 7 inch end nippers, stamped with "Giant Nipper" near the pivot, with "Kraeuter & Co." and "Newark, N.J. U.S.A." on the reverse (see middle inset). The handles are marked with "Kraeuter U.S.A." forged into the underside. The overall length is 7.1 inches, and the finish is plain steel with traces of black paint. Fig. 57B. 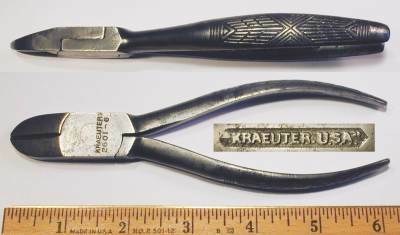 Kraeuter 1850-7 "Supreme" 7 Inch End Nippers, with Insets for Side View and Reverse Detail, ca. Late 1930s to Mid 1940s. Fig. 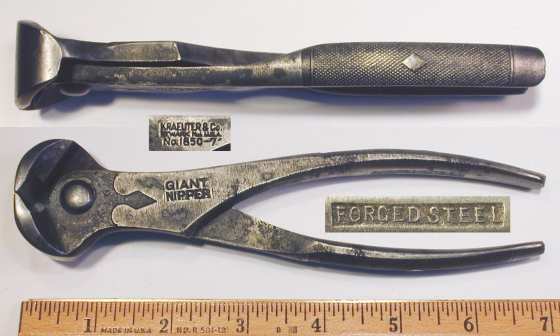 57B shows a later pair of Kraeuter 1850-7 "Supreme" 7 inch end nippers, stamped with "Supreme Nipper" near the pivot, with "Kraeuter" and the model number on the reverse (see middle inset). The handles have smooth underside with a stamped "9" digit. The overall length is 7.0 inches, and the finish is plain steel with some remaining black paint. The "Supreme" marking on these model 1850 pliers is somewhat unexpected, as it was the similar model 1851 nippers that were given the "Supreme" designation in the 1946 catalog. The models 1850 and 1851 nippers differ only in the finish though, so possibly this example was just mismarked. Fig. 58. Kraeuter 1850-7 7 Inch End Nippers, with Inset for Jaw Detail, ca. Mid 1940s to 1950s. Fig. 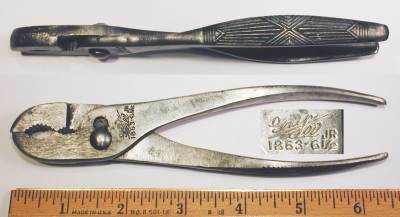 58 shows a later pair of Kraeuter 1850-7 7 inch end nippers, stamped with "Kraeuter" and the model number in a circle, with "USA" in the center. The circular marking style indicates production in the mid 1940s or later. The model 1850 pliers were part of Kraeuter's "Industrial" line from the mid 1940s onward. The 1851 end nipper models were identical to the 1850 series except for the "Kraeuter Finish", which the catalogs described as polished steel with black oxide for the knurled areas. Fig. 59. Kraeuter 1851-5 "Giant Nipper" 5 Inch End Nippers, with Insets for Side View and Marking Detail, ca. 1924 to Late 1930s. Fig. 59 shows an early pair of Kraeuter 1851-5 "Giant Nipper" 5 inch end nipper, marked with "Kraeuter USA" and the model number on the reverse, and with "Kraeuter, U.S.A." forged into the underside (see middle inset). The overall length is 5.5 inches, and the finish is polished steel, now darkened with the effects of age and rust. The model 1850 and model 1851 nippers were identical except for the finish, which was black paint and the "Kraeuter" finish, respectively. The catalog described the Kraeuter finish as polished steel with black oxide for the knurled areas. Fig. 60. Kraeuter 1851-7 "Giant Nipper" 7 Inch End Nippers, with Insets for Side View and Reverse Detail, ca. 1924 to Late 1930s. Fig. 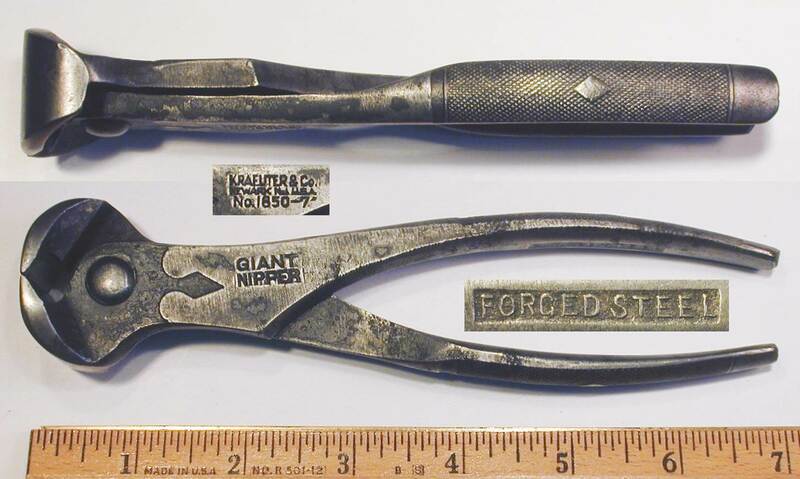 60 shows a pair of Kraeuter 1851-7 7 inch end nippers, stamped with "Giant Nipper" near the pivot, with "Kraeuter USA" and the model number on the reverse (see lower inset). The handles are also marked with "Kraeuter U.S.A." forged into the underside. The top inset shows a side view of the pliers, illustrating the Kraeuter "Don't Slip" geometric gripping pattern on the handles. This pattern was registered as design patent #D46,682, issued to A.A. Kraeuter in 1914. Fig. 61. Kraeuter 2601-5 5 Inch Diagonal Cutters, with Insets for Side View and Marking Detail, ca. 1924 to Late 1930s. Fig. 61 shows a pair of Kraeuter 2601-5 5 inch diagonal cutters, stamped with "Kraeuter" and "USA" across the pivot, with "Kraeuter U.S.A." forged into the underside of the handles. Fig. 62. Kraeuter 2601-6 6 Inch Diagonal Cutters, with Insets for Side View and Marking Detail, ca. 1924 to Late 1930s. Fig. 62 shows a pair of Kraeuter 2601-6 6 inch diagonal cutters, stamped with "Kraeuter" and the model number across the pivot, with "Kraeuter U.S.A." forged into the underside of the handles. Fig. 63. Kraeuter 4501-4-1/2 Diagonal Cutters, with Inset for Side View, ca. Mid 1940s to 1950s. Fig. 63 shows a pair of Kraeuter 4501-4-1/2 diagonal cutting pliers, stamped with "Kraeuter" and the model number around the pivot, with "USA" across the center. The overall length is 4.7 inches, and the finish is black oxide. The circular marking style indicates production from 1946 onward. The model 4501 diagonal cutting pliers were listed as early as the 1939 catalog, and by 1946 were part of the "Industrial" line established by Kraeuter in the mid 1940s. Fig. 63B. Kraeuter 4501-6 Diagonal Cutters, with Inset for Side View, ca. Mid 1940s to 1950s. Fig. 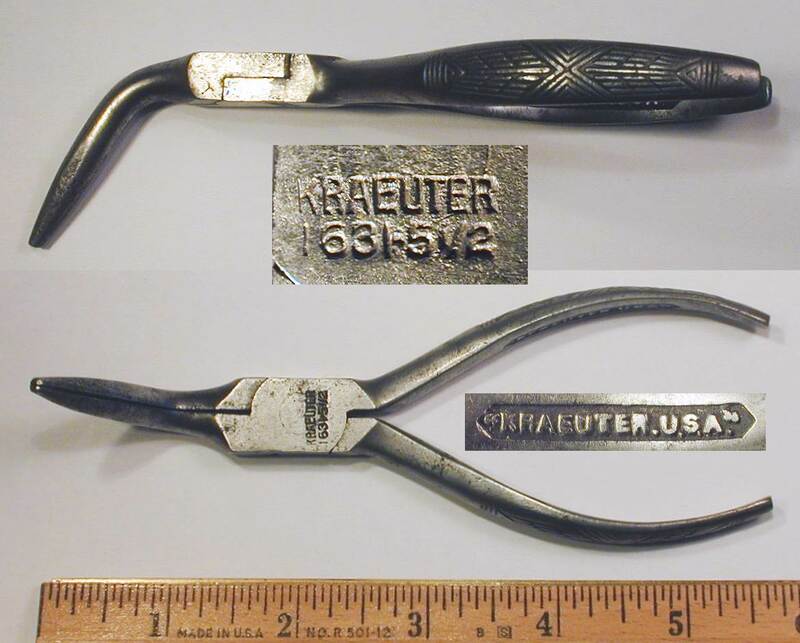 63B shows a pair of Kraeuter 4501-6 diagonal cutting pliers, stamped with "Kraeuter" and the model number around the pivot, with "USA" across the center. Fig. 64. Kraeuter 2611-6.5 6.5 Inch Heavy-Duty Diagonal Cutters, with Insets for Reverse, Side View, and Marking Detail, ca. 1924-1933. Fig. 64 shows a pair of Kraeuter 2611-6.5 heavy-duty diagonal cutting pliers, stamped with "Kraeuter" and the model number across the pivot, and with "Kraeuter U.S.A." forged into the underside of the handles. The model 2611 pliers were not listed in the 1934 catalog, having apparently been superseded by the similar model 4611 pliers. Fig. 65A. Kraeuter 1611-6 6 Inch Round Nose Pliers, with Insets for Side View and Marking Detail, ca. 1910-1920. Fig. 65A shows an early pair of Kraeuter 1611-6 6 inch round nose pliers, stamped with "Kraeuter & Co." and "Newark, N.J. U.S.A." near the pivot, and with "Forged Steel" forged into the underside of the handles. The overall length is 6.1 inches, and the finish is polished steel. The dimpled gripping pattern and "Newark" marking suggest production in the range 1910-1920. Fig. 65B. Kraeuter 1621-6 6 Inch Needlenose Pliers, with Inset for Side View, ca. Mid 1940s to 1950s. Fig. 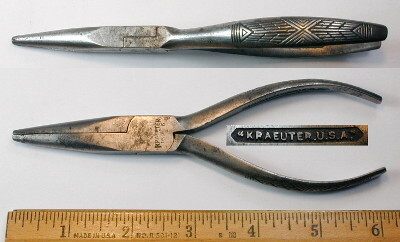 65B shows a pair of Kraeuter 1621-6 6 inch long needlenose pliers, stamped with "Kraeuter" and the model number around the pivot, with "USA" across the center. The model 1621 pliers were part of Kraeuter's "Industrial" line from the mid 1940s onward. Fig. 66. Kraeuter 1631-5-1/2 5.5 Inch Bent Needlenose Pliers, with Insets for Side View and Marking Detail, ca. 1924 to Late 1930s. Fig. 66 shows a pair of Kraeuter 1631-5-1/2 5.5 inch bent needlenose pliers, stamped with "Kraeuter" and the model number across the pivot, with "Kraeuter U.S.A." forged into the underside of the handles. Fig. 67. Kraeuter 1641-5 5 Inch Short Needlenose Side-Cutting Pliers, with Inset for Reverse Detail, ca. Mid 1940s to 1950s. Fig. 67 shows a pair of Kraeuter 1641-5 5 inch short needlenose pliers with side-cutters, stamped with "Kraeuter" and the model number around the pivot, with "USA" in the center. The reverse is stamped "Kraeuter" and "Industrial" around the pivot. The model 1641 pliers were part of Kraeuter's "Industrial" line from the mid 1940s onward. Fig. 68. Kraeuter 1661-6 6 Inch Short Needlenose Side-Cutting Pliers, ca. Mid 1940s to 1950s. Fig. 68 shows a pair of Kraeuter 1661-6 6 inch short needlenose pliers with side-cutters, stamped with "Kraeuter" and the model number around the pivot, with "U.S.A." in the center. The circular marking style indicates production from the mid 1940s or later. The model 1661 pliers were part of Kraeuter's "Industrial" line from the mid 1940s onward. The next two figures show examples of the Kraeuter 1671 pliers. Fig. 69A. Kraeuter 1671-6 6 Inch Needlenose Pliers, with Insets for Handle Pattern and Marking Detail, ca. Early 1920s. Fig. 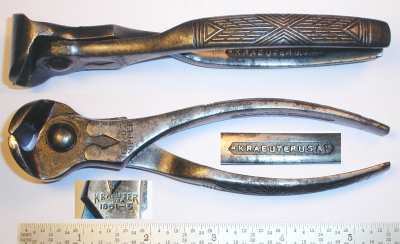 69A shows a pair of Kraeuter 1671-6 6 inch needlenose pliers, stamped with "Kraeuter" and "USA" across the pivot, with "Kraeuter U.S.A." forged into the underside of the handles. The upper inset shows the pattern forged into the handle, a dimpled field with a central diamond. 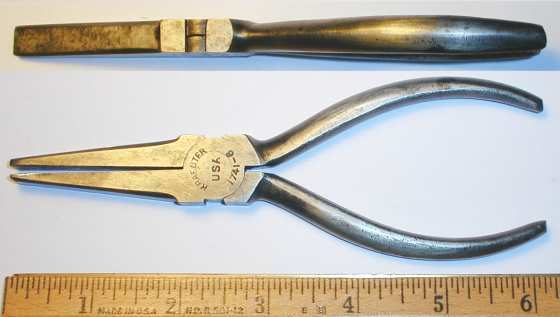 These pliers are unusual in retaining the "Dimple-Diamond" gripping pattern with the forged-in "Kraeuter U.S.A." marking. Fig. 69B. Kraeuter 1671 6 Inch Needlenose Pliers, with Insets for Handle Pattern and Marking Detail, ca. Mid 1940s to 1950s. Fig. 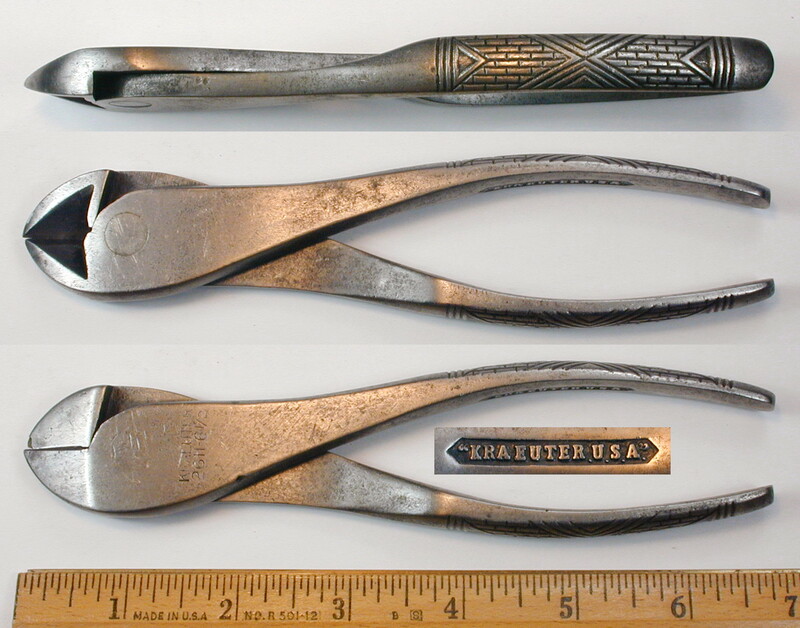 69B shows a later pair of Kraeuter 1671 6 inch needlenose pliers, stamped "Kraeuter" and "USA" around the pivot. The circular marking style indicates production from the mid 1940s or later. The model 1671 pliers were part of Kraeuter's "Industrial" line from the mid 1940s onward. Fig. 70. Kraeuter 1691-6 6 Inch Needlenose Pliers, with Insets for Side View and Marking Detail, ca. 1924 to Mid 1930s. Fig. 70 shows a pair of Kraeuter 1691-6 6 inch needlenose pliers, stamped with "Kraeuter" and "USA" and the model number across the pivot, and with "Kraeuter U.S.A." forged into the underside of the handles. The overall length is 6.0 inches, and the finish is polished steel. 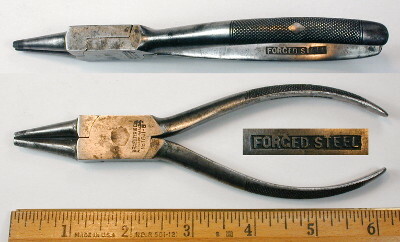 The top inset shows a side view of the pliers, illustrating the "Don't Slip" gripping pattern forged into the handles. Fig. 71. Kraeuter 1711-5 5 Inch Long-Nose Pliers, with Insets for Side View and Marking Detail, ca. 1910 to 1920. Fig. 71 shows a pair of Kraeuter 1711-5 5 inch long-nose pliers, marked with "Kraeuter & Co." and "Newark, N.J. U.S.A." stamped across the pivot, with "Forged Steel" forged into the underside of the handles. The inside of the handles are fitted with posts apparently used to hold a spring, but the spring was missing when the tool was acquired. Fig. 72. Kraeuter 1721-6 6 Inch Long-Nose Side-Cutting Pliers, with Insets for Side View and Marking Detail, ca. 1924 to Late 1930s. Fig. 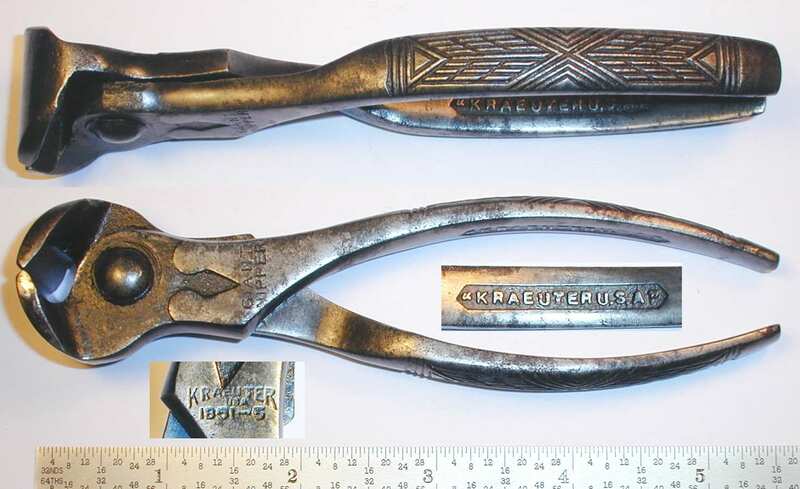 72 shows a pair of Kraeuter 1721-6 6 inch long nose side-cutting pliers, stamped "Kraeuter USA" near the pivot, and with "Kraeuter U.S.A." forged into the underside of the handles. This style of pliers has a flat wide tip and was recommended by the Kraeuter catalog for electrical work. The next several figures show examples of the model 1771 pliers spanning two generations of production. Fig. 73. Kraeuter 1771-7 7 Inch Extra Long Nose Pliers, with Insets for Side View and Marking Detail, ca. 1924 to Late 1930s. Fig. 73 shows a pair of Kraeuter 1771-7 7 inch extra long nose pliers, stamped "Kraeuter USA" with the model number across the pivot, with "Kraeuter U.S.A." forged into the underside of the handles. The overall length is 6.7 inches, although the tip may have been shortened slightly by grinding. The finish is plain steel with some pitting due to rust, but the catalog lists the original finish as "Blue Temper". 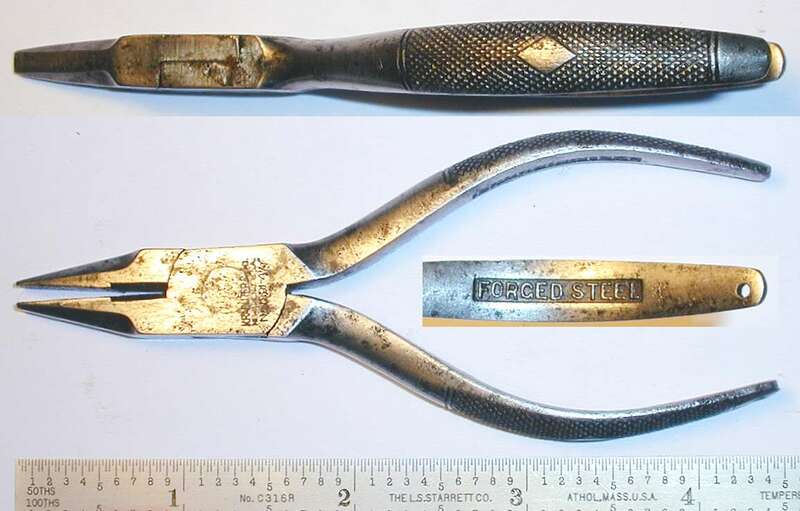 The upper inset shows a side view of the pliers, illustrating the "Don't Slip" pattern on the handles. Fig. 74A. Kraeuter 1771-7 7 Inch Extra Long Nose Pliers, with Insets for Side View and Marking Detail, ca. 1924 to Late 1930s. Fig. 74A shows another similar pair of Kraeuter 1771-7 7 inch extra long nose pliers, stamped with "Kraeuter" and the model number across the pivot, with "Kraeuter U.S.A." forged into the underside of the handles. The upper inset shows a side view of the pliers, illustrating the "Don't Slip" gripping pattern on the handles. Fig. 74B. Kraeuter 1771-7 7 Inch Extra Long Nose Pliers, with Inset for Side View, ca. Mid 1940s to 1950s. Fig. 74B shows a later pair of Kraeuter 1771-7 7 inch extra long nose pliers, stamped with "Kraeuter" and the model number around the pivot, with "USA" across the center. The top inset shows a side view of the pliers, illustrating the smooth handles found in later production of this model. The circular marking style indicates production from the mid 1940s or later. The model 1771 pliers were part of Kraeuter's "Industrial" line from the mid 1940s onward. Fig. 75. Kraeuter 1591-4-1/2 4.5 Inch Milliner's Flat-Nose Side-Cutting Pliers, with Insets for Side View and Detail, ca. 1910-1920. Fig. 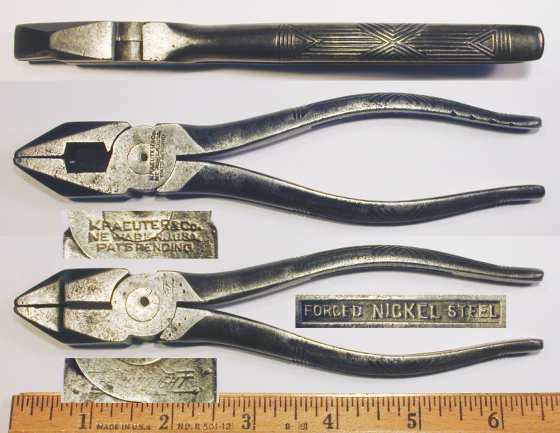 75 at the left shows a pair of Kraeuter 1591-4-1/2 4.5 inch Milliner's flat-nose side-cutting pliers, stamped with "Kraeuter" and "Newark, N.J. U.S.A." near the pivot, and with "Forged Steel" forged into the underside of the handles. The overall length is 4.4 inches, and the finish is polished steel. The handles have a dimpled pattern with a central raised diamond, and one handle is drilled for a hanging loop, as shown in the lower inset. The model 1601 flat-nose pliers were available in the five sizes 4, 4.5, 5, 5.5, and 6 inches. Fig. 76A. Kraeuter 1601-4 4 Inch Flat-Nose Pliers, with Insets for Side View and Marking Detail, ca. 1910-1920. Fig. 76A shows a diminutive pair of Kraeuter 1601-4 4 inch flat-nose pliers, stamped with "Kraeuter" and "Newark, N.J. U.S.A." near the pivot, and with "Forged Steel" forged into the underside of the handles. The overall length is 4.0 inches, and the finish is polished steel with black oxide. The top inset shows a side view of the pliers, illustrating the dimpled gripping pattern with a central raised diamond. The model 1601 pliers are similar to the model 1591 pliers, but without the side-cutting edges. Fig. 76B. Kraeuter 1601-4-1/2 4.5 Inch Flat-Nose Pliers, with Insets for Side View and Marking Detail, ca. 1910-1920. Fig. 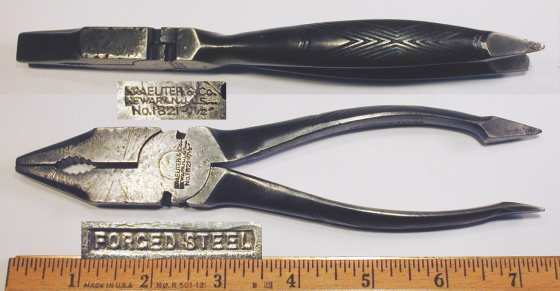 76B shows a pair of Kraeuter 1601-4-1/2 4.5 inch flat-nose pliers, stamped with "Kraeuter" and "Newark, N.J. U.S.A." near the pivot, and with "Forged Steel" forged into the underside of the handles. The overall length is 4.5 inches, and the finish is polished steel with some nickel plating remaining. Fig. 77. Kraeuter 1741-6 6 Inch Long Flat-Nose Pliers, with Inset for Side View, ca. Mid 1940s to 1950s. Fig. 77 shows a pair of Kraeuter 1741-6 6 inch flat-nose pliers, marked with "Kraeuter" and the model number around the pivot, with "USA" across the center. The circular marking style indicates production from the mid 1940s or later. The model 1741 pliers were part of Kraeuter's "Industrial" line from the mid 1940s onward. Fig. 78. Kraeuter 1751-6 6 Inch Long Flat-Nose Side-Cutting Pliers, with Insets for Side View and Reverse Detail, ca. Mid 1940s to 1950s. Fig. 78 shows a pair of Kraeuter 1751-6 6 inch long flat-nose pliers with side cutters, stamped with "Kraeuter" and the model number around the pivot, with "USA" across the center. The reverse is stamped with "Kraeuter" and "Industrial" around the pivot. The circular marking style indicates production from the mid 1940s or later. The model 1751 pliers were part of Kraeuter's "Industrial" line from the mid 1940s onward.